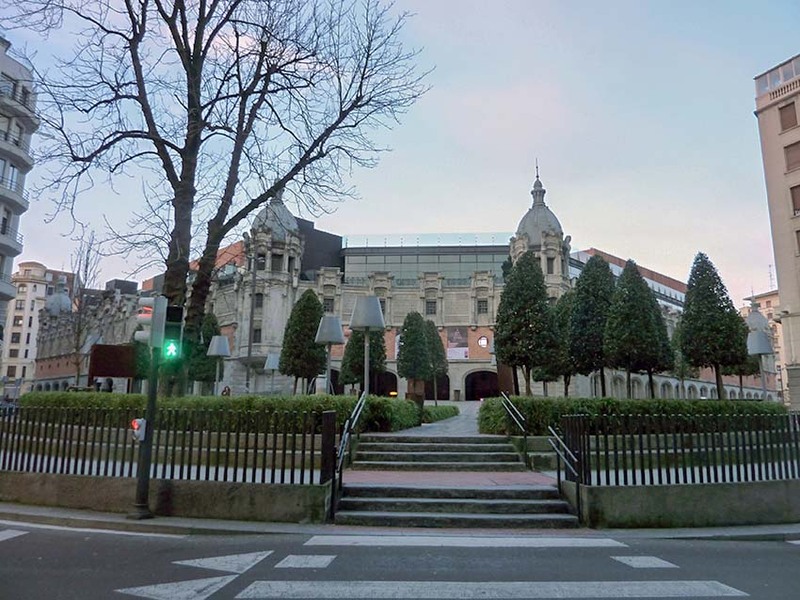 Below the Harino Panadera factory, you must walk through the new Amézola park and residential complex towards the Azkuna Zentroa - Alhóndiga; this is a cultural centre (14) renovated by Philippe Stark in 2010, from an old wine warehouse designed by Ricardo Bastida between 1905 and 1909. 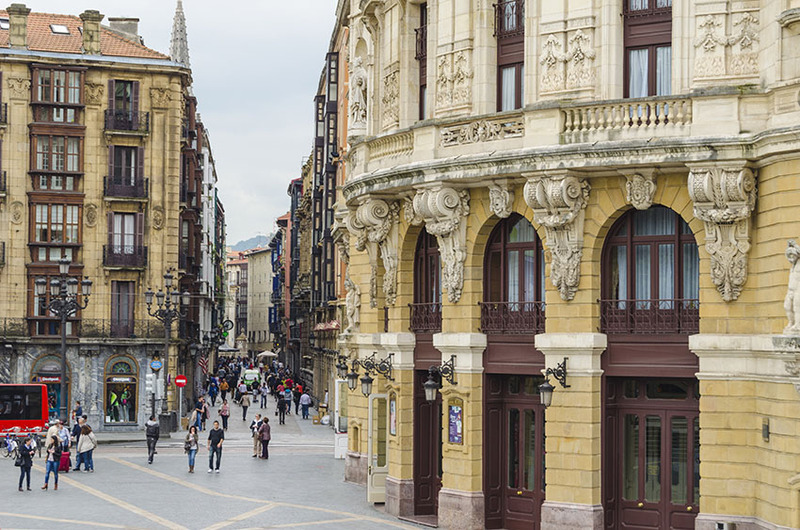 As one of the icons of the new Bilbao, this is probably one of the essential sights of the city that you will already have seen. 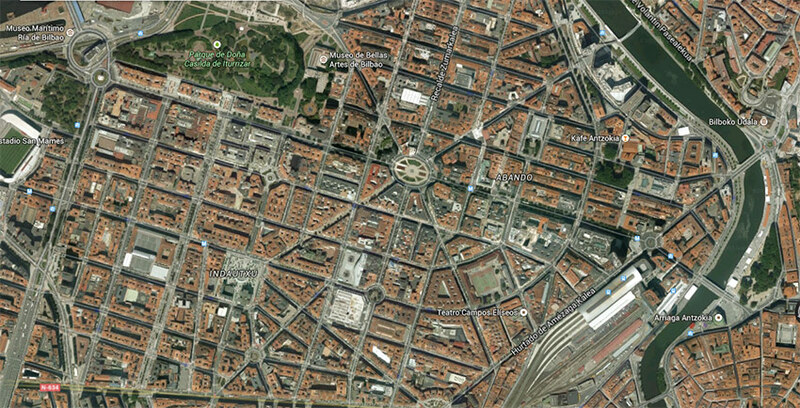 To get there, we offer the following street tour: General Salazar - Carmelo Gil - Autonomía - Iparraguirre. 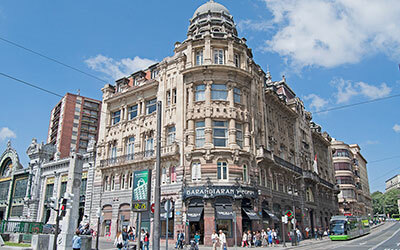 After visiting it, walk along Fernández del Campo street to Hurtado de Amezaga street. 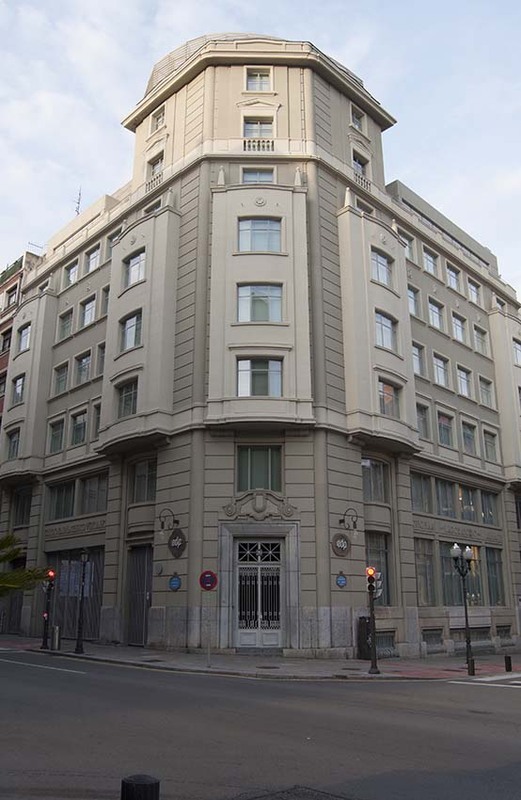 Along this route, on the corner of General Concha street, you will see a building that is the current headquarters of the energy company EDP. 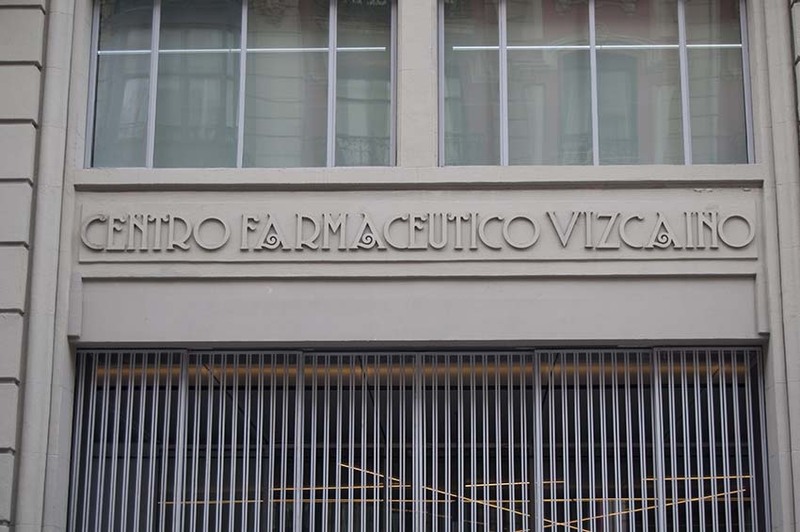 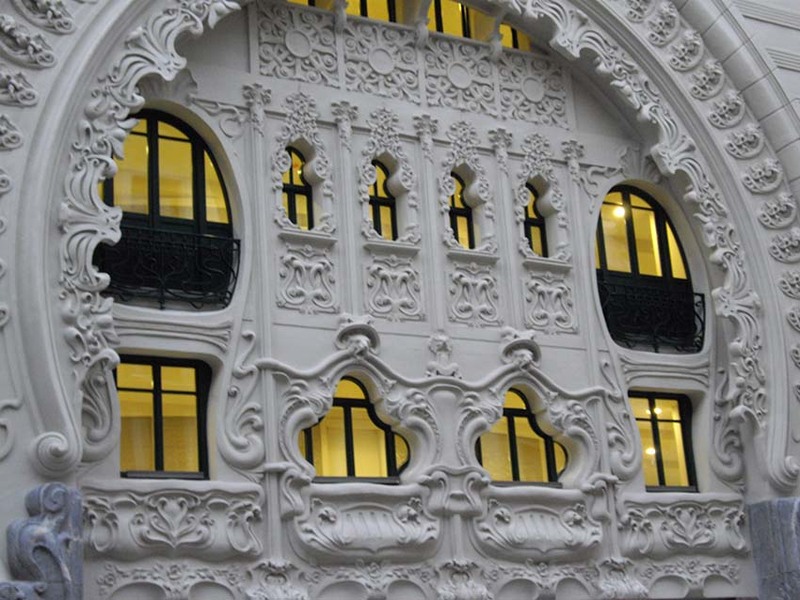 Completely renovated inside, it has kept the facade of its original occupant: the Centro farmacéutico Vizcaíno (15). 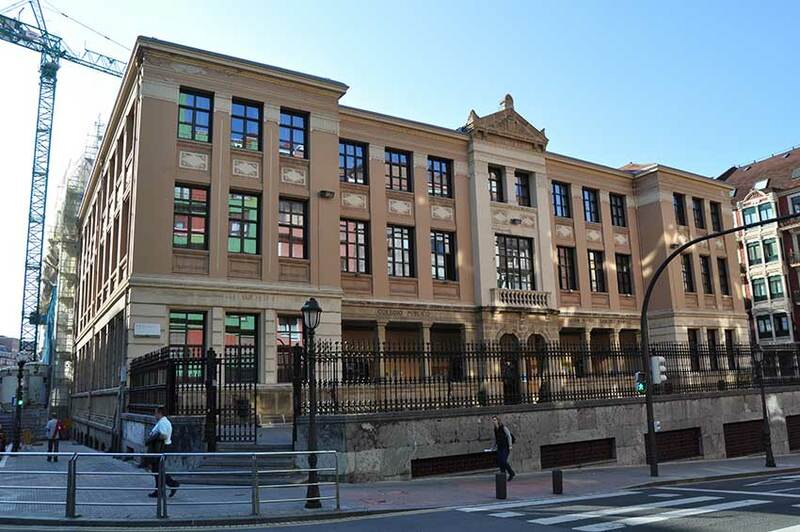 Built in 1926 by architect Tomás Bilbao and Hilario Imaz, it initially had 2 floors which were extended to 7 current ones in the 1940s. 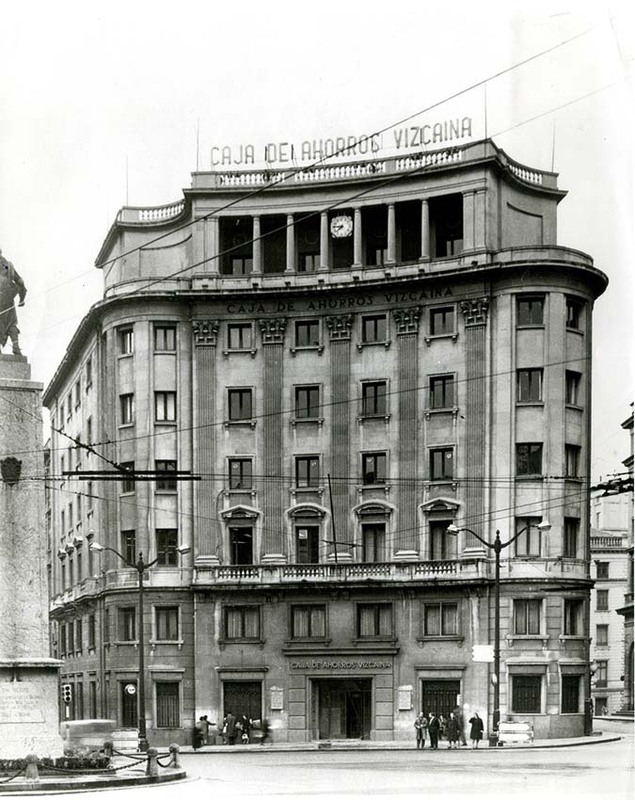 Set up by Bizkaian pharmacists, it centralised the distribution of medicine. 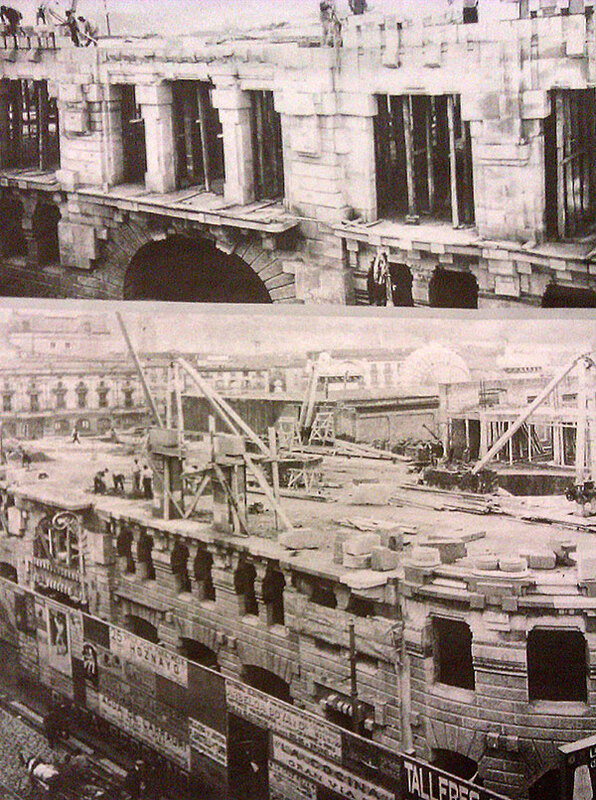 Of special interest on the building are the original stone signs with the company name in both streets. 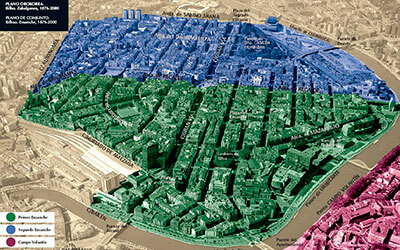 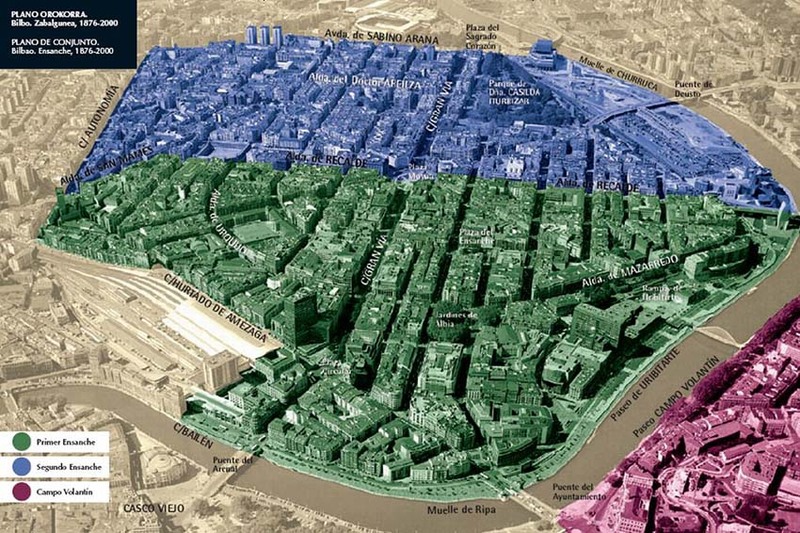 You are in the middle of the Ensanche, the enlargement of the original city. 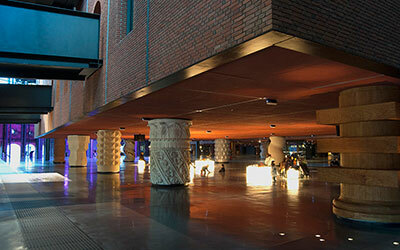 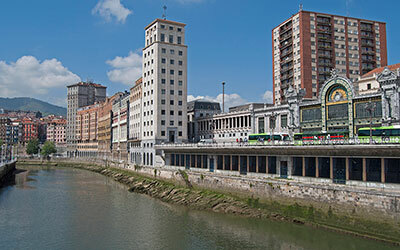 It is one of the most interesting in Spain; in fact, it has lasted perfectly throughout the 20th century and as such, it is often said to be the best architectural work in Bilbao. 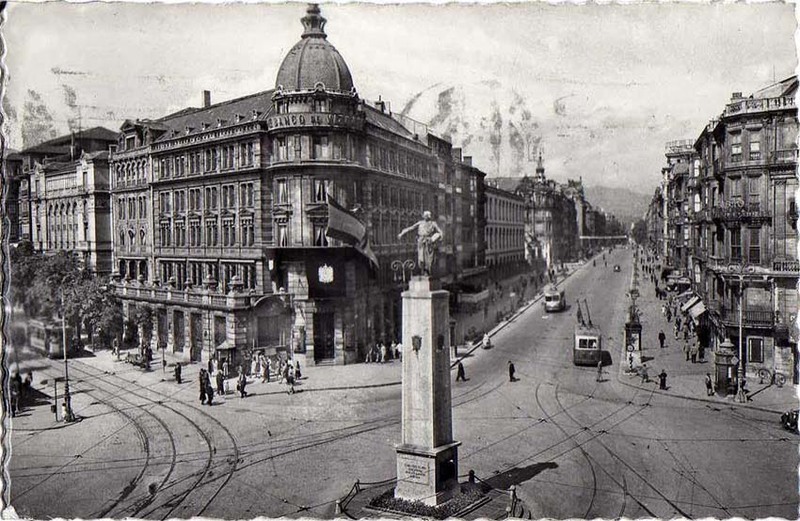 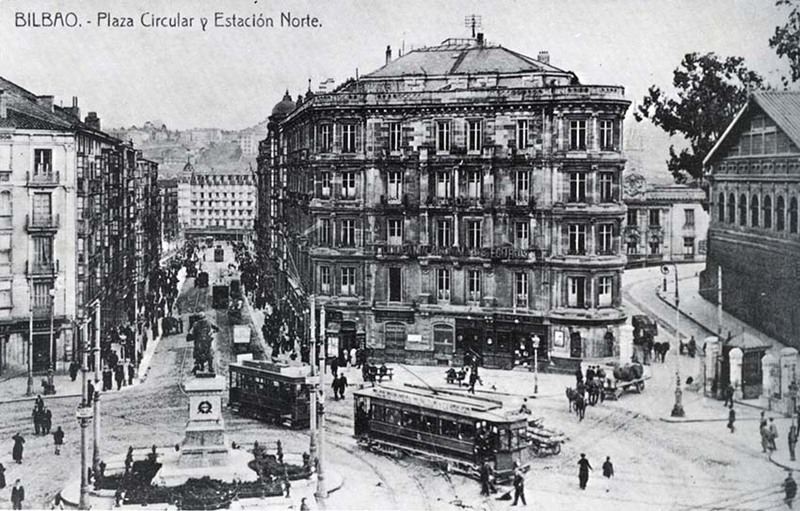 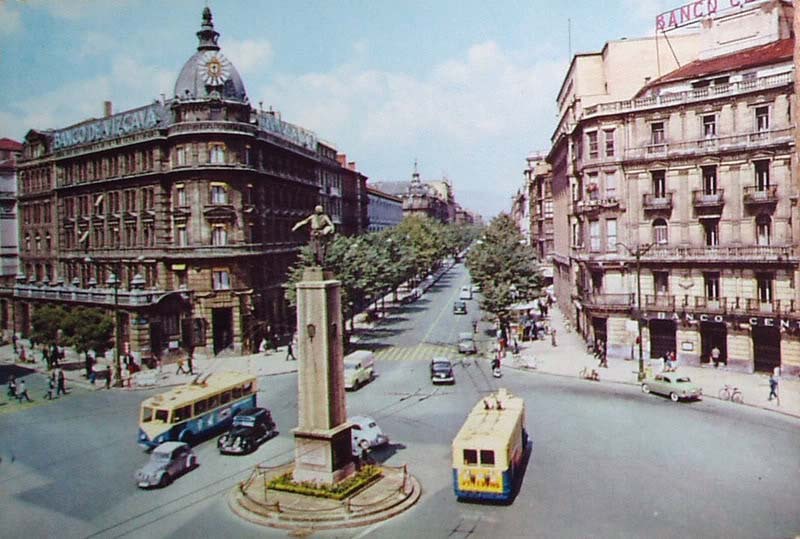 Severino Achúcarro, Pablo Alzola and Ernesto Hoffmeyer designed it in 1876, and this first extension presents an interesting layout, with the Gran Vía as the main artery forming a longitudinal axis which leads to the Casco Viejo via the Arenal bridge, punctuated by three squares (the Plaza Circular, the Plaza Elíptica and the Plaza de Sagrado Corazón). 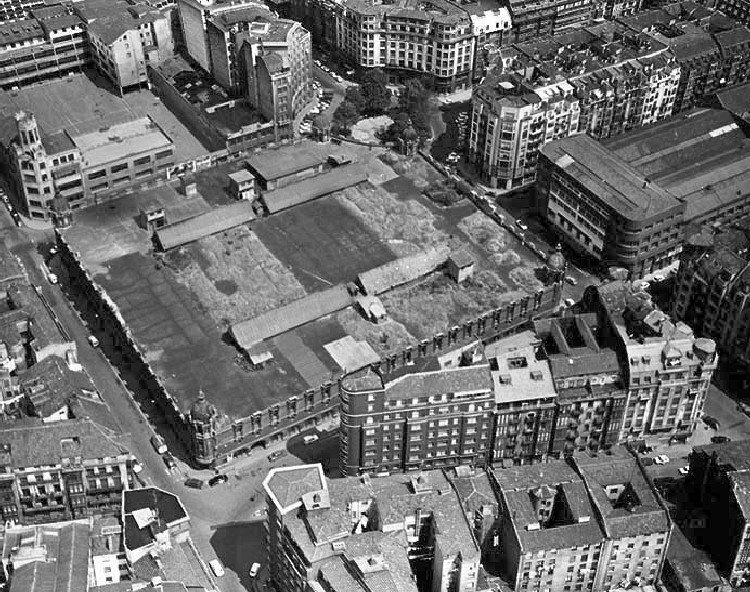 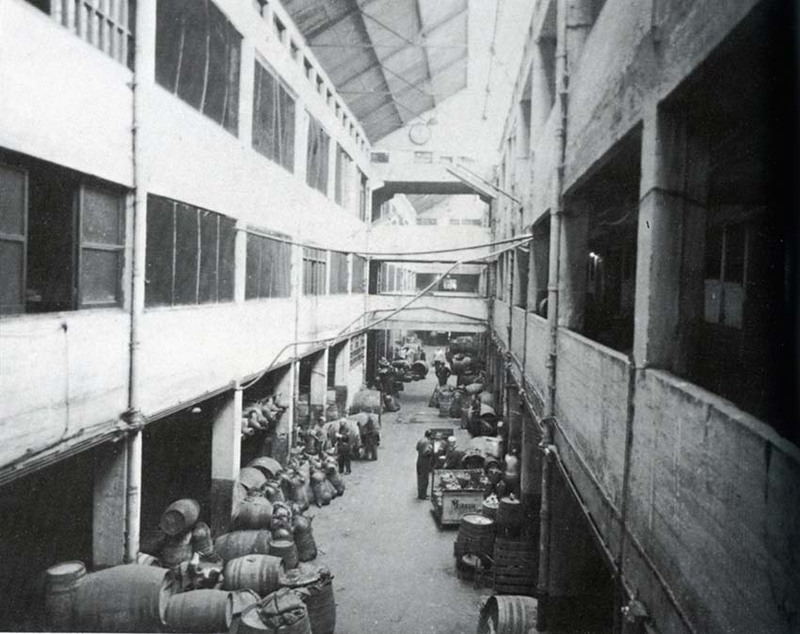 The building of the Ensanche area in Abando was a process that was delayed for decades, which meant they were able to learn from the example of Ildefonso Cerdá in Barcelona, with its layout and its street blocks with bevelled finishing. 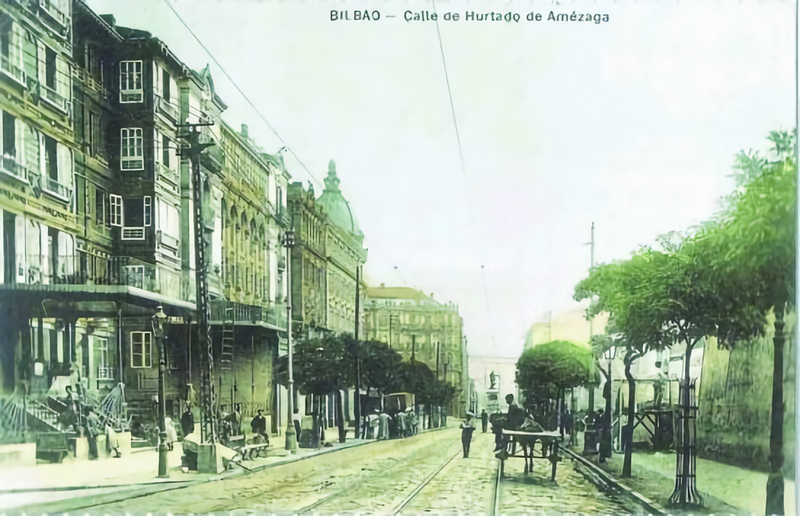 It was the response to new needs arising from the fact that the population had tripled in just 20 years and the Casco Viejo old quarter was insufficient to house them. 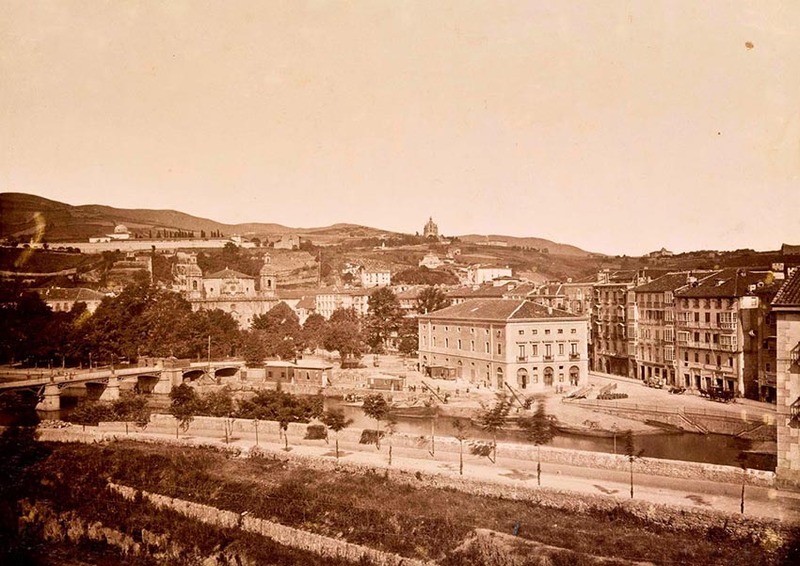 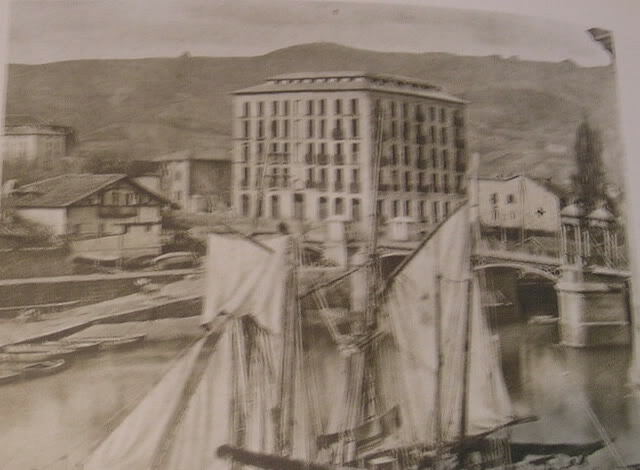 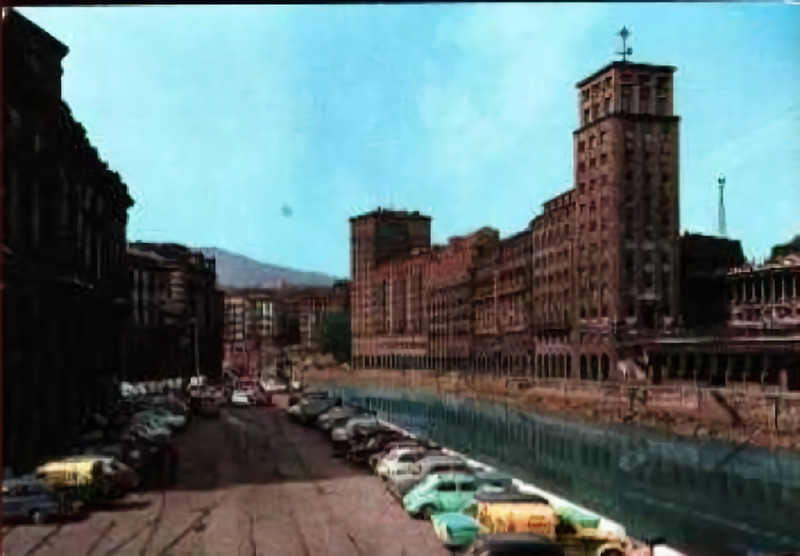 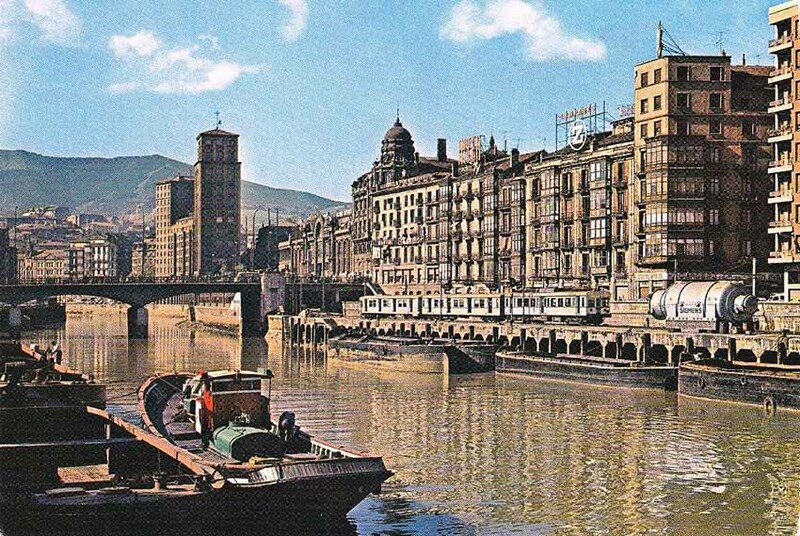 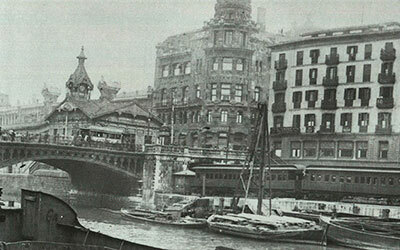 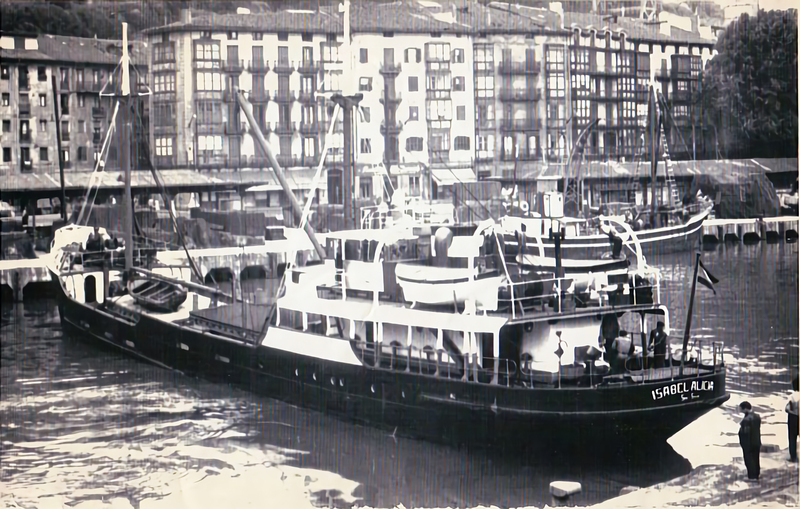 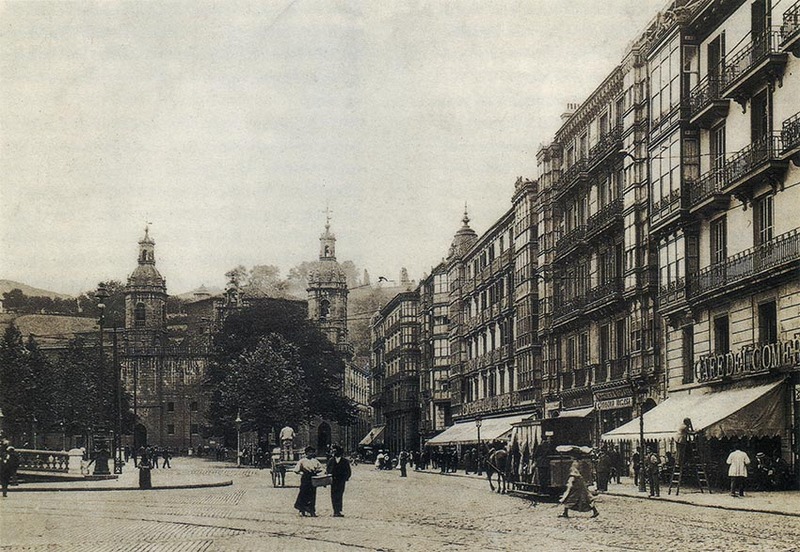 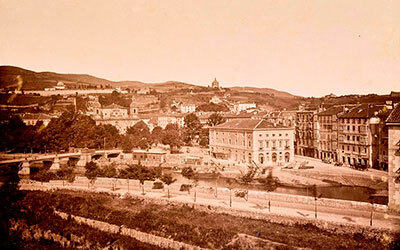 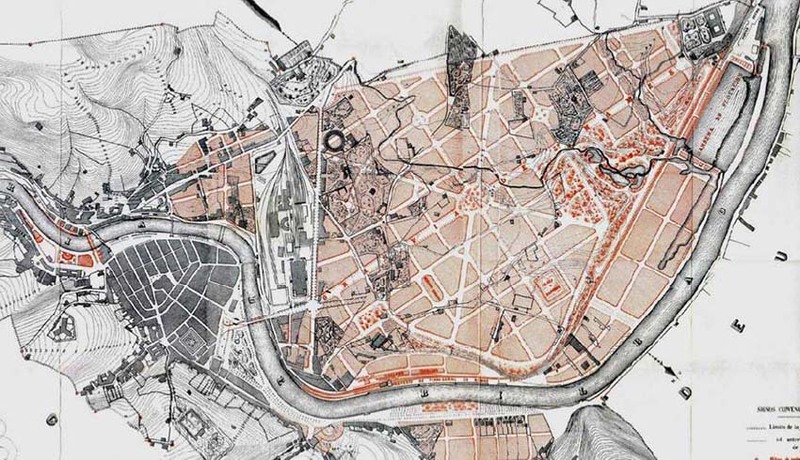 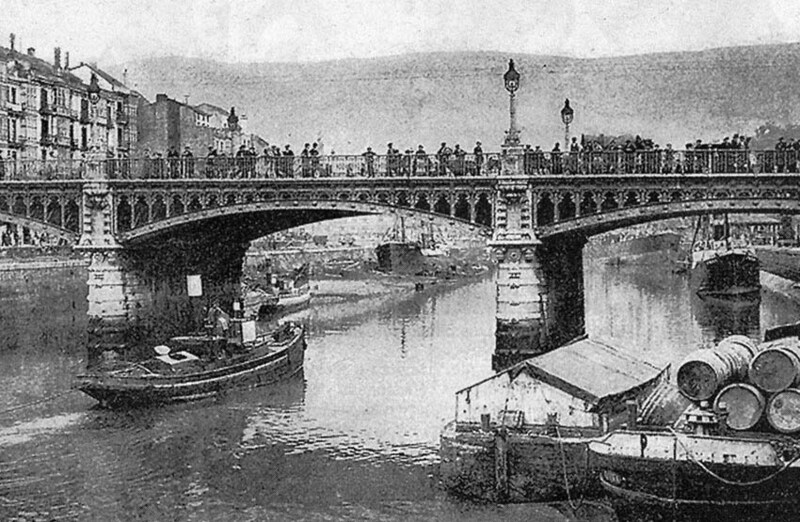 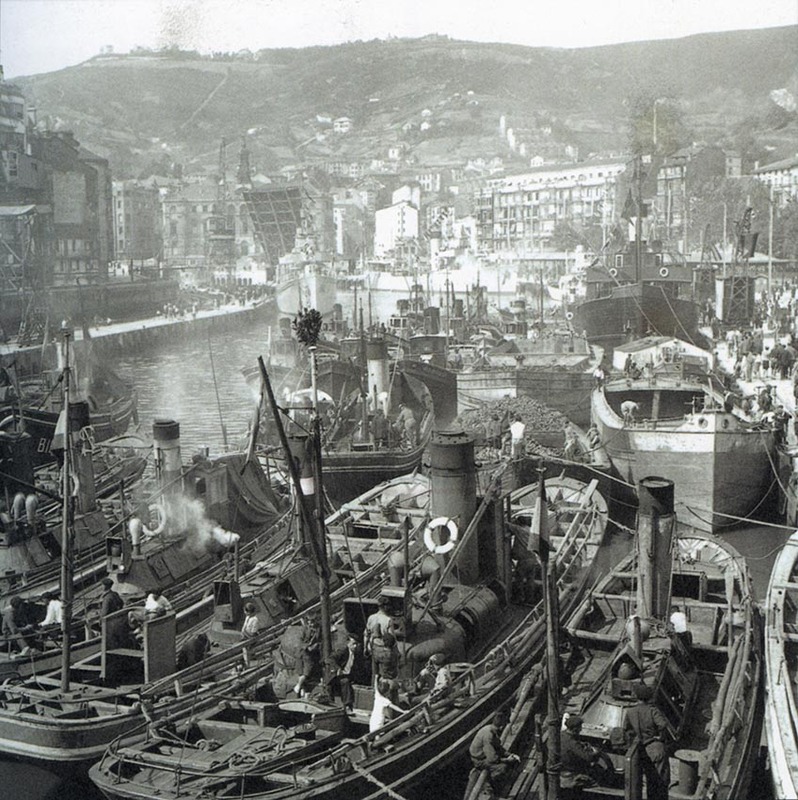 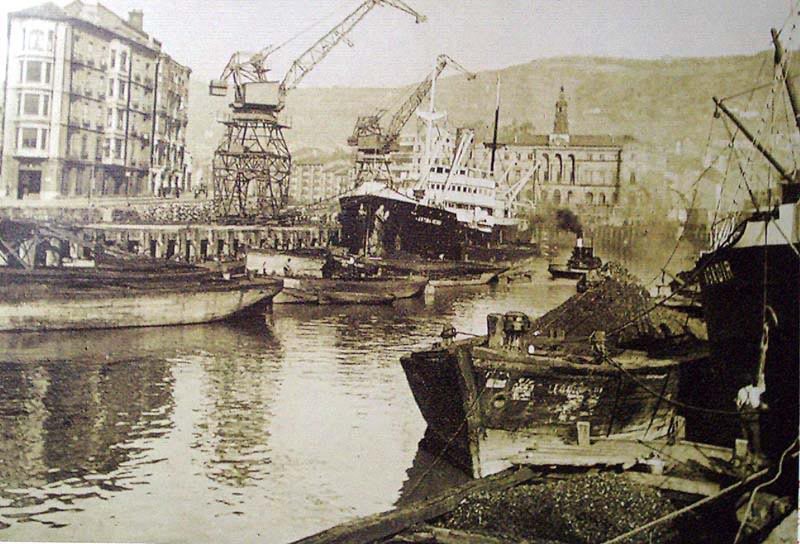 With its construction, Bilbao definitively jumped onto the left bank of the river and developed what is now considered to be the centre of the city. 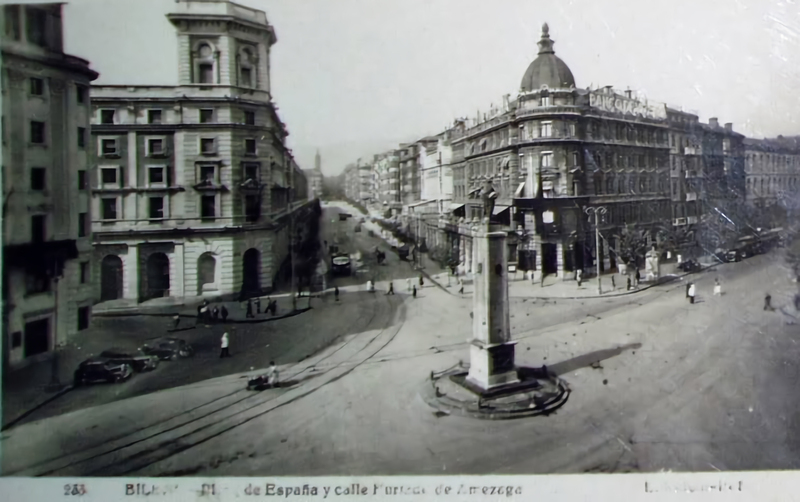 We walk down Fernández del Campo Street to Hurtado Amezaga street. 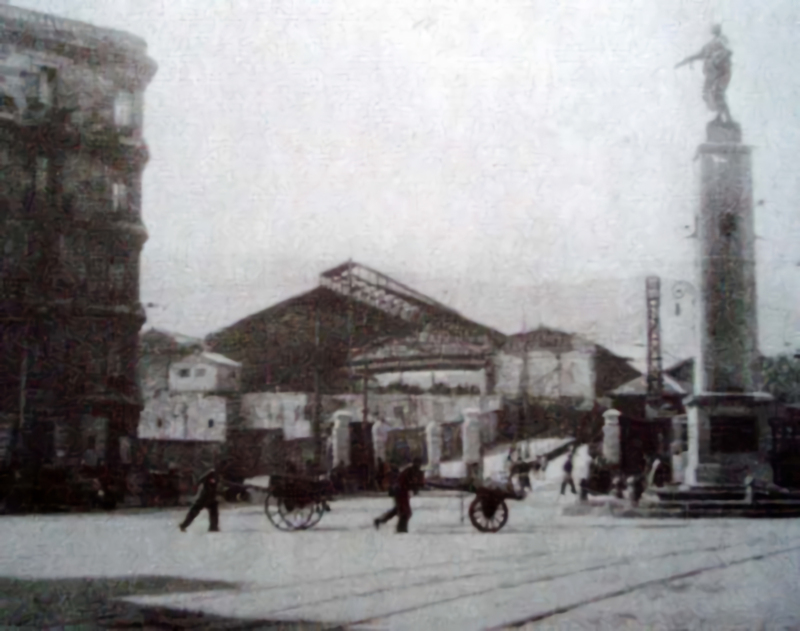 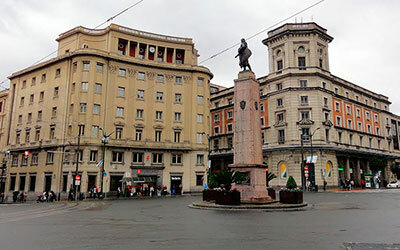 Walking down to the Plaza Circular, you will see the start of the forecourt of Abando railway station. 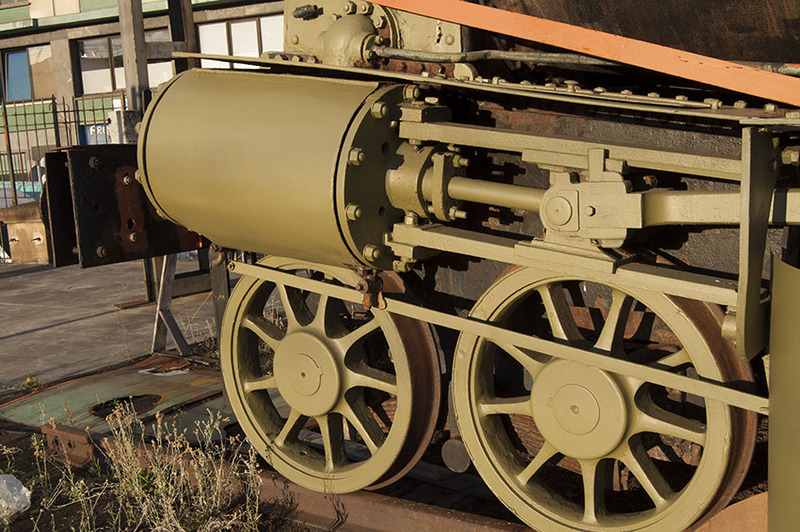 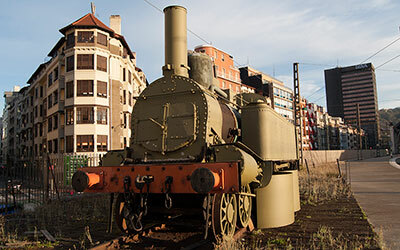 Right on the corner of García Salazar street the Izarra locomotive (16), is on display, a jewel in the railway heritage crown, as it was one of the first locomotives to come to Bilbao in 1863. 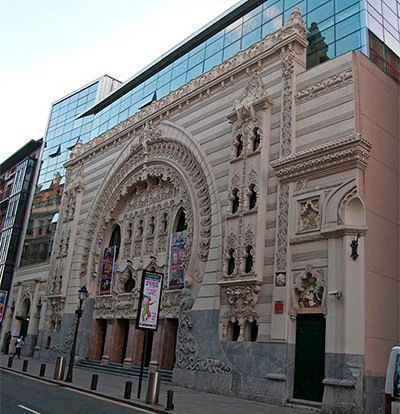 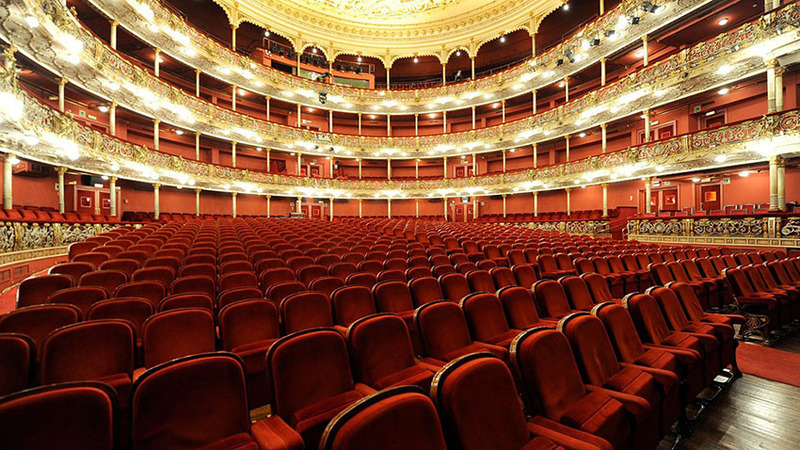 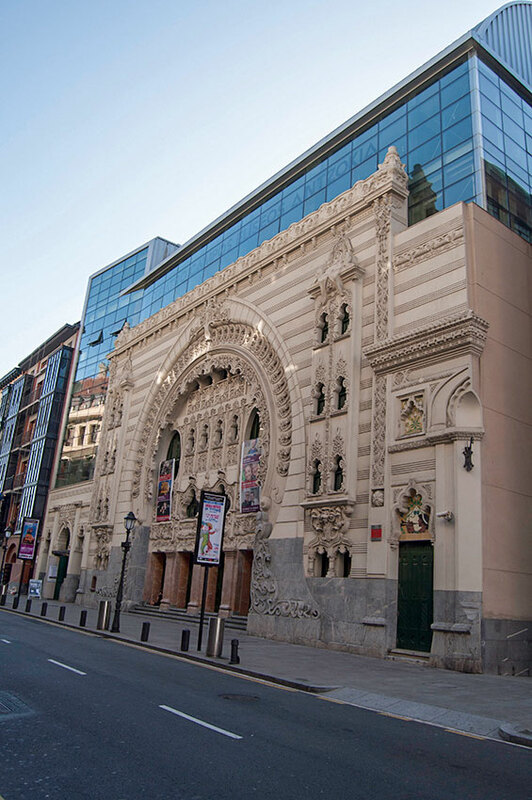 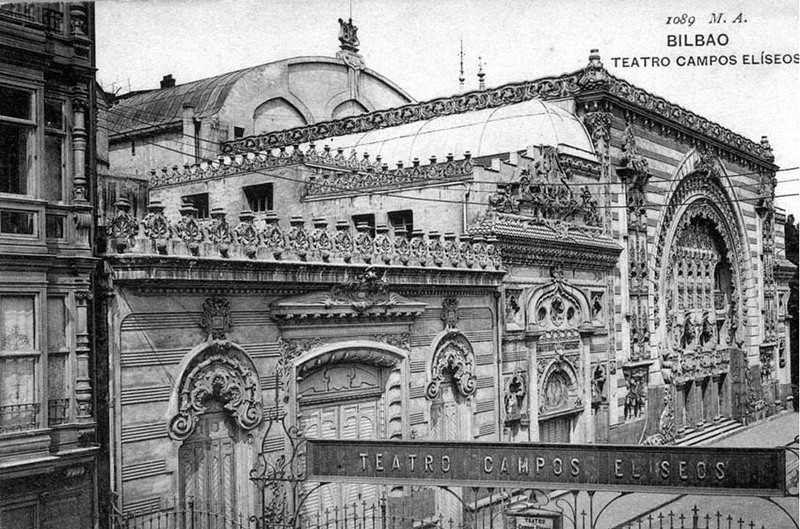 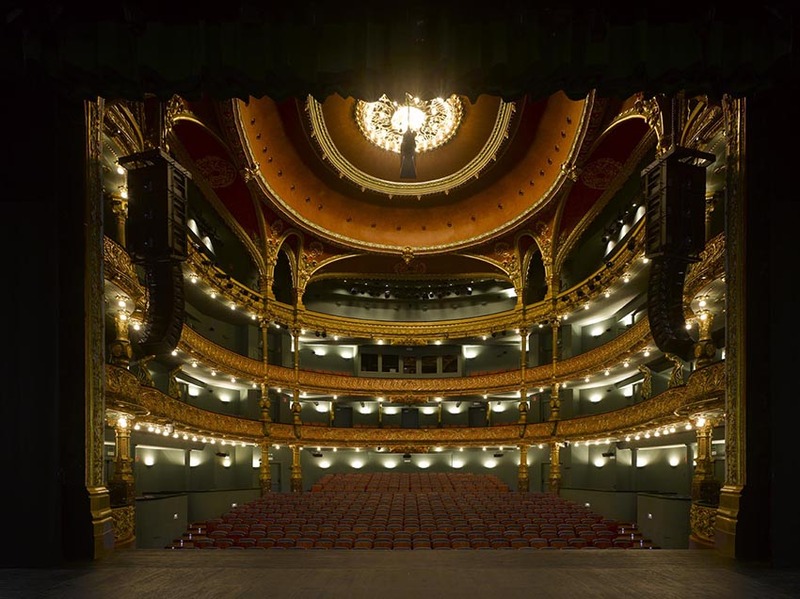 Before going down to the Plaza Circular, we recommend walking along Bertendona street to look at the magnificent modernist facade of the Campos Elíseos theatre (17). 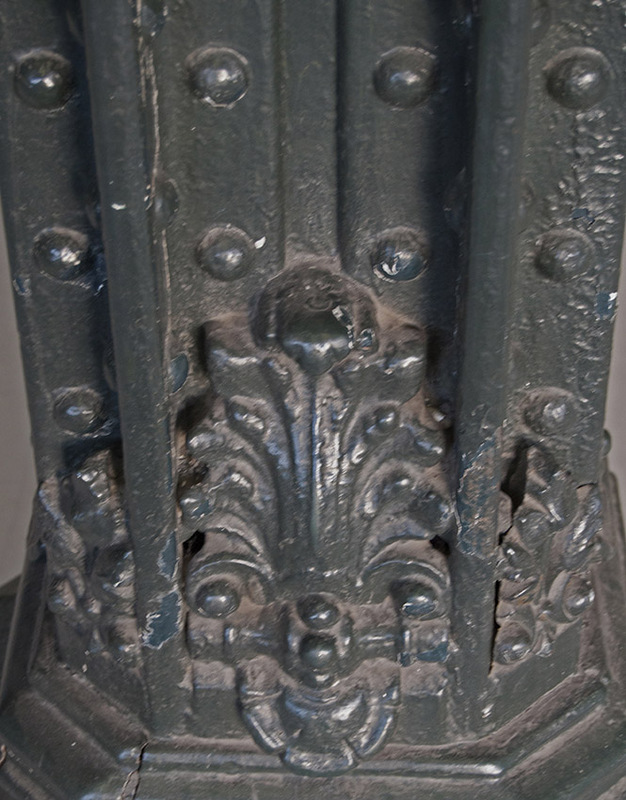 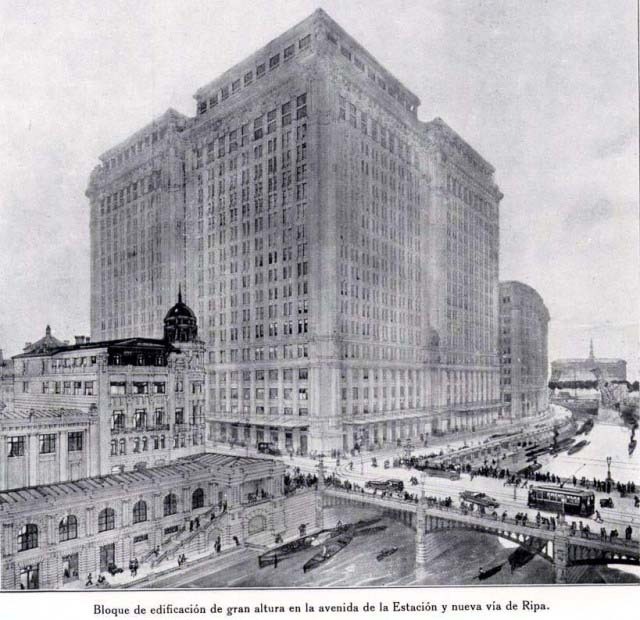 Opened in 1902, it was the result of collaboration between architect Alfredo Acebal and the French designer Jean Batiste Darroquy. 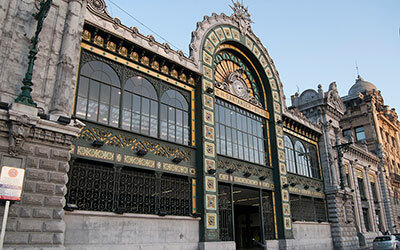 The decor and forms of its facade made people call it "The Chocolate Box". 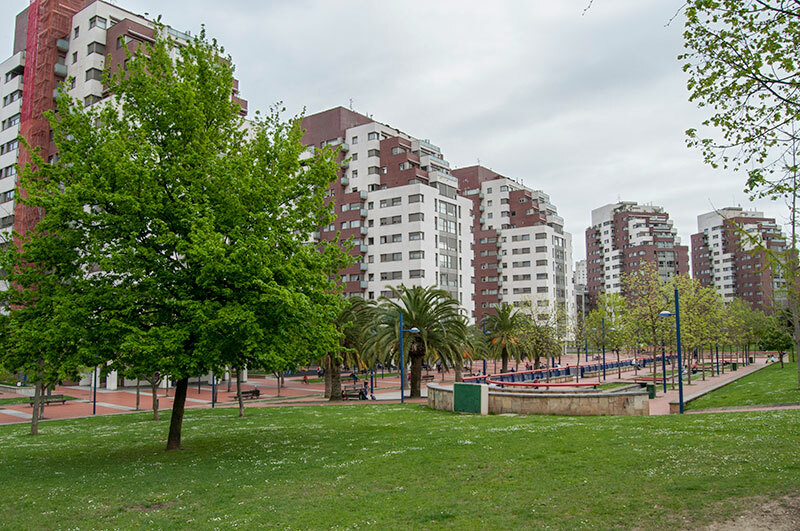 In the Plaza Circular, we see the BBVA tower (18). 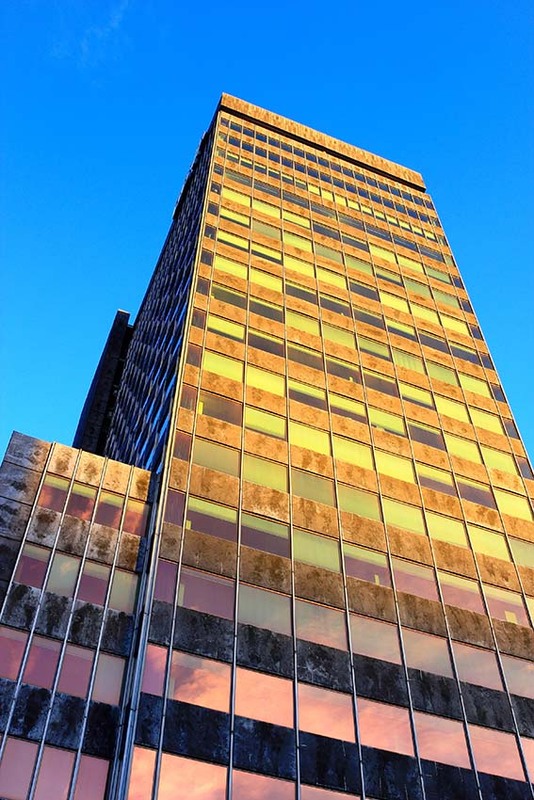 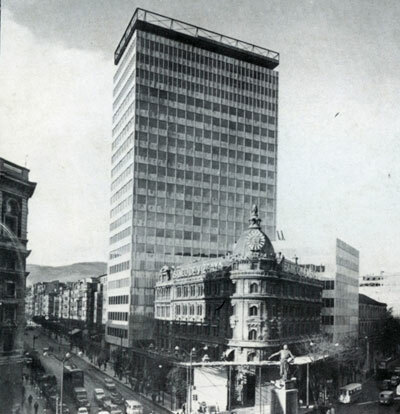 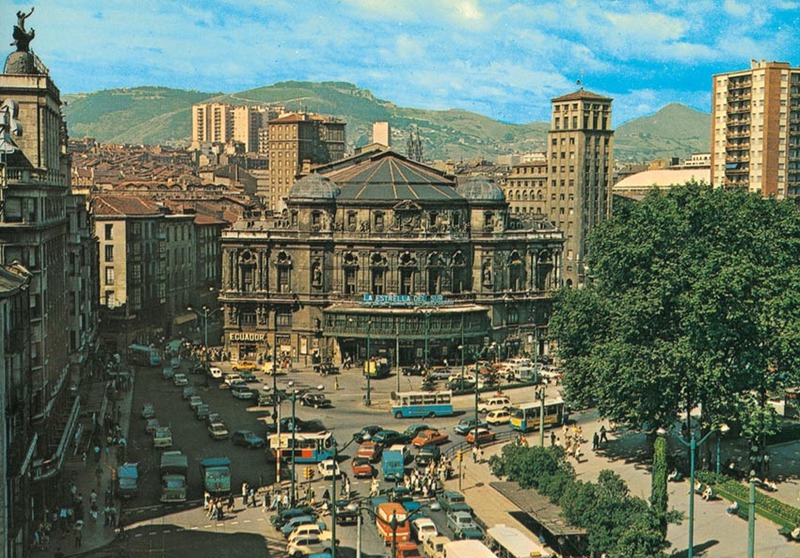 88 m high, in 1969 it replaced the former headquarters building of the Bank of Vizcaya, which merged with the Bank of Bilbao to make the current international bank. 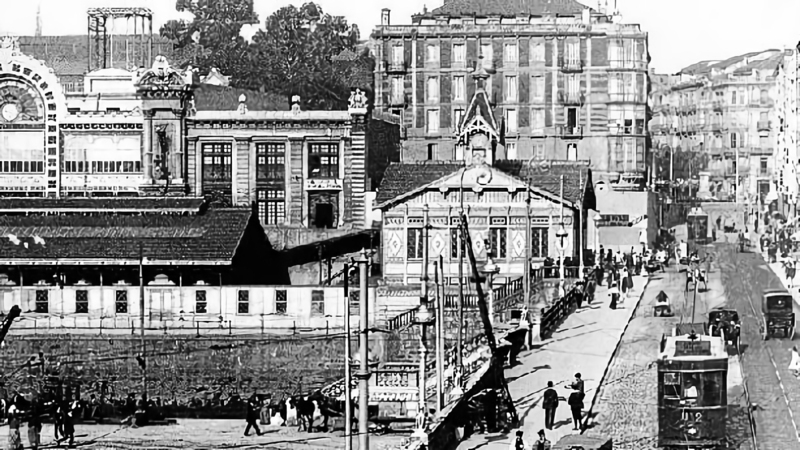 Next to the station is the building that now houses the tourist office (19). 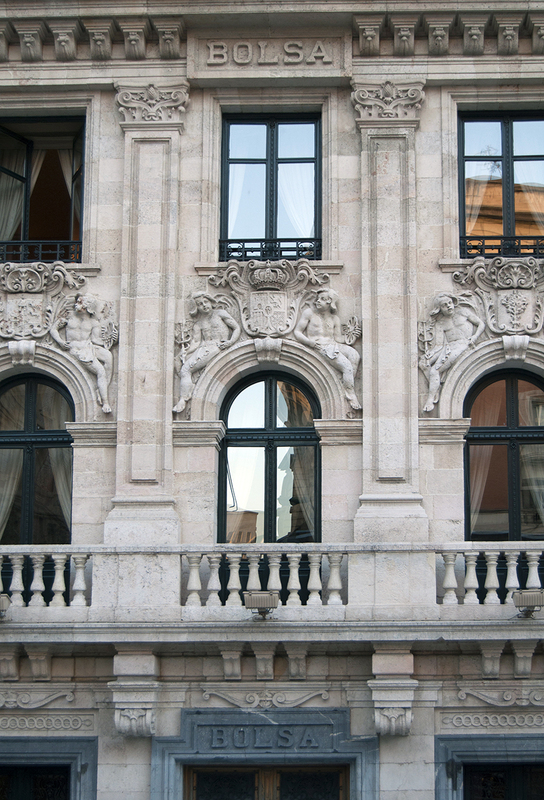 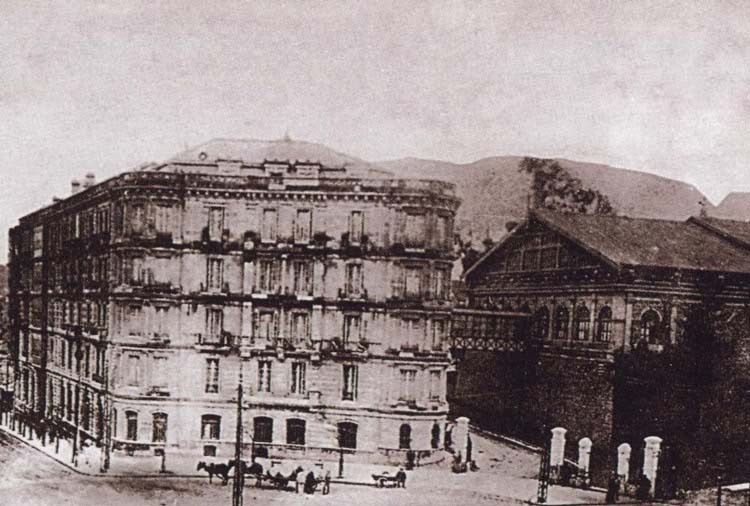 It was the work of Severino Achúcarro, and opened in 1893 as a Hotel that was linked by a direct walkway to the station. 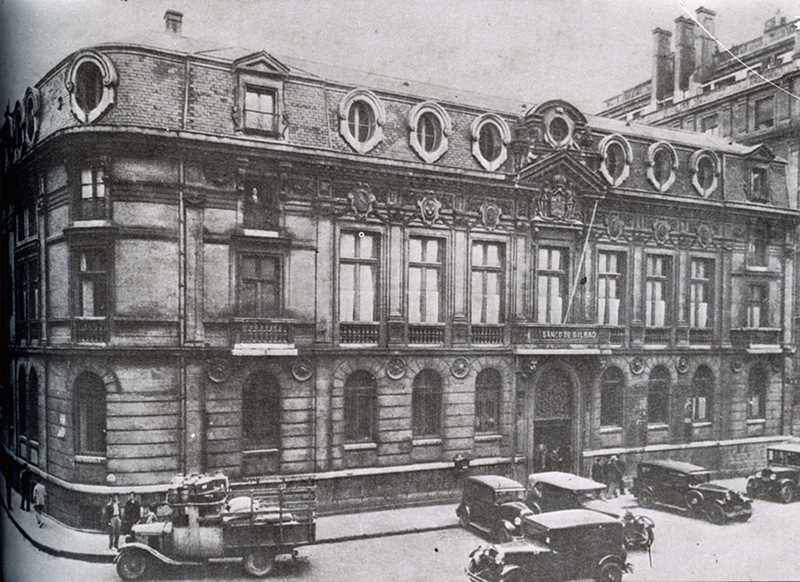 In 1949 it became a bank office prior to its current use. 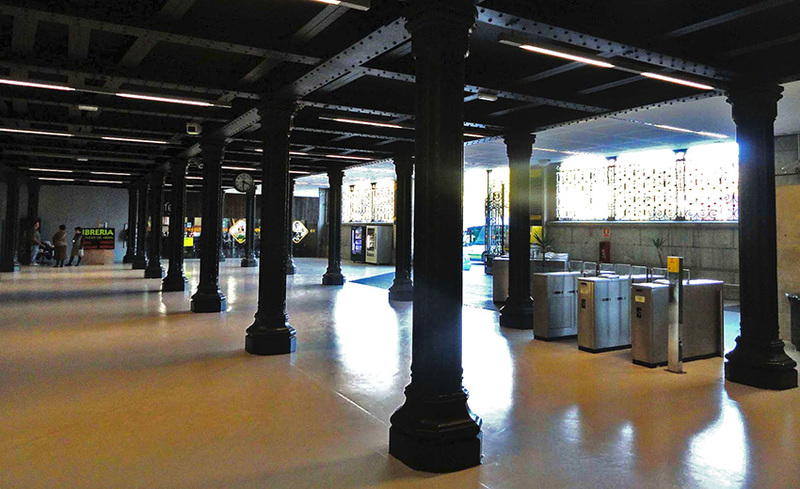 In the Plaza Circular is the access to Abando station (20). 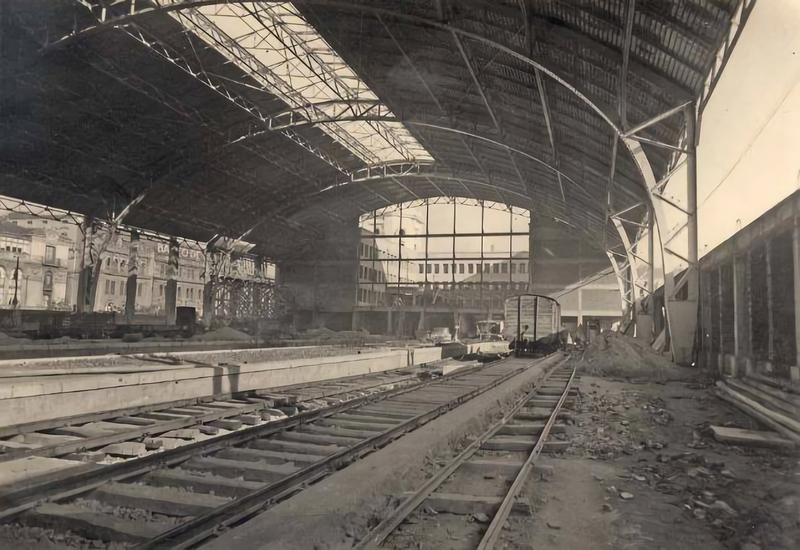 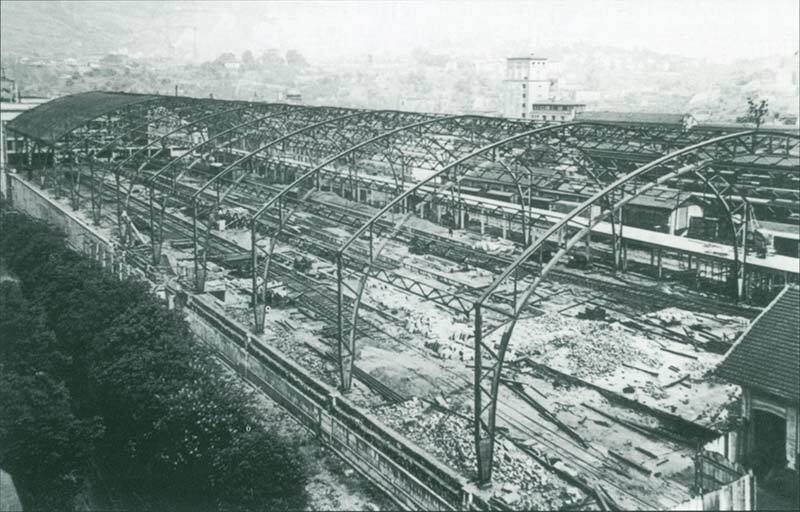 In 1948, the current station replaced the previous one, which had been built in 1864. 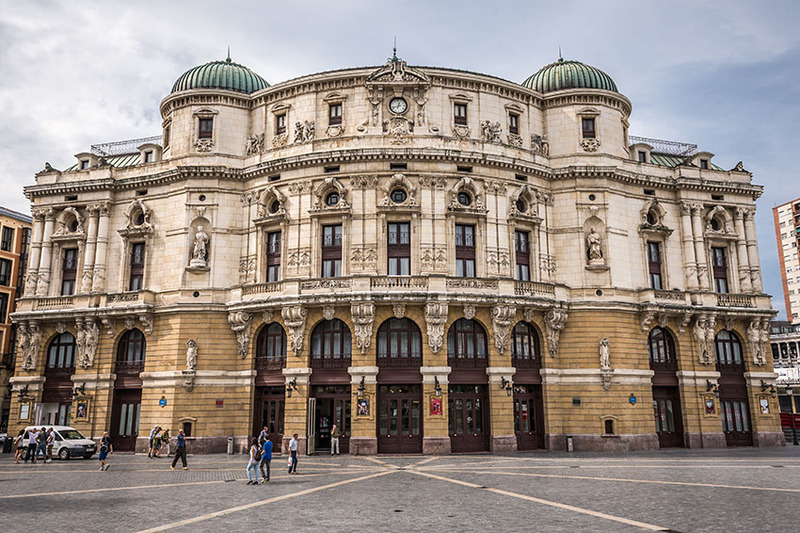 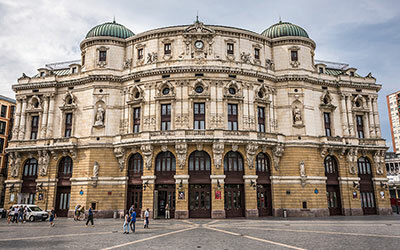 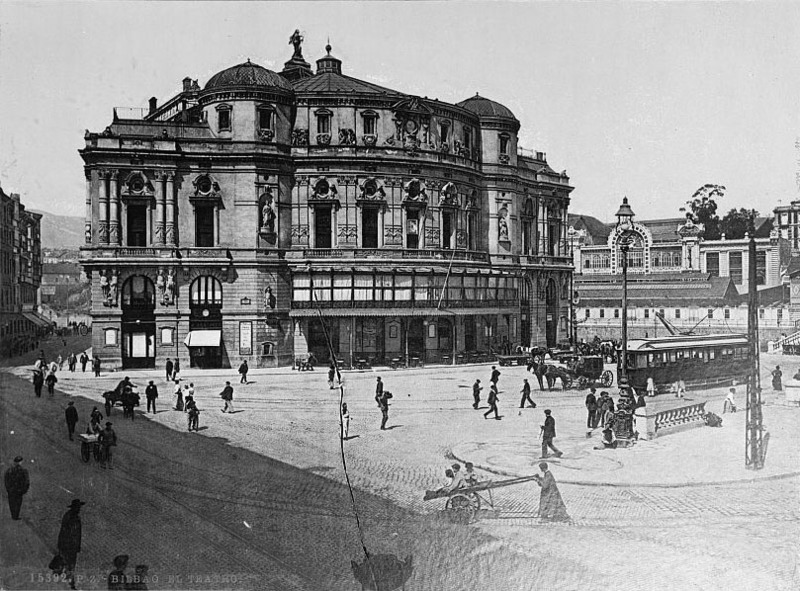 The main facade avoids railway themes, presenting a monumental, classical image with an eclectic mix of pediments, blind arches or false pillars, which harmonized with the surrounding buildings. 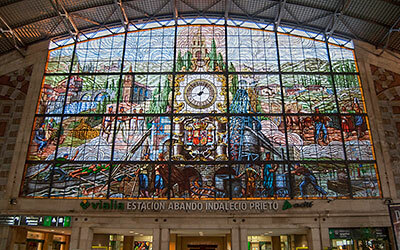 Once inside, go to the upper level to look at the large stained-glass window that welcomes travellers arriving in the city. 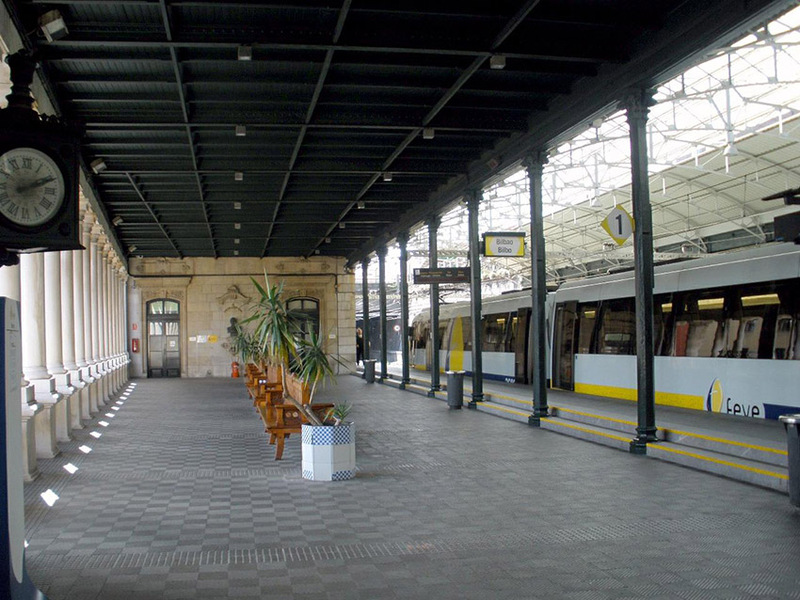 Back in the lower central hall, turn right and go out and down the stairs at the back of the station, and here you will be able to cross to the back entrance of the other, almost adjoining, station. 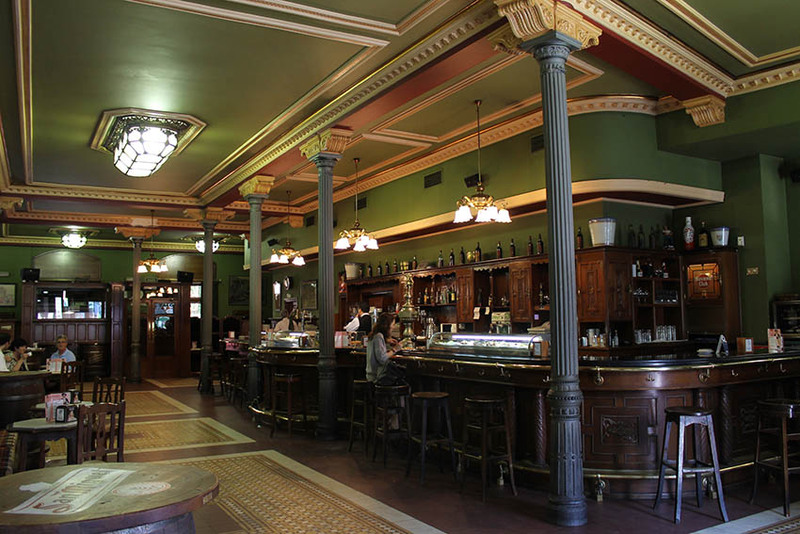 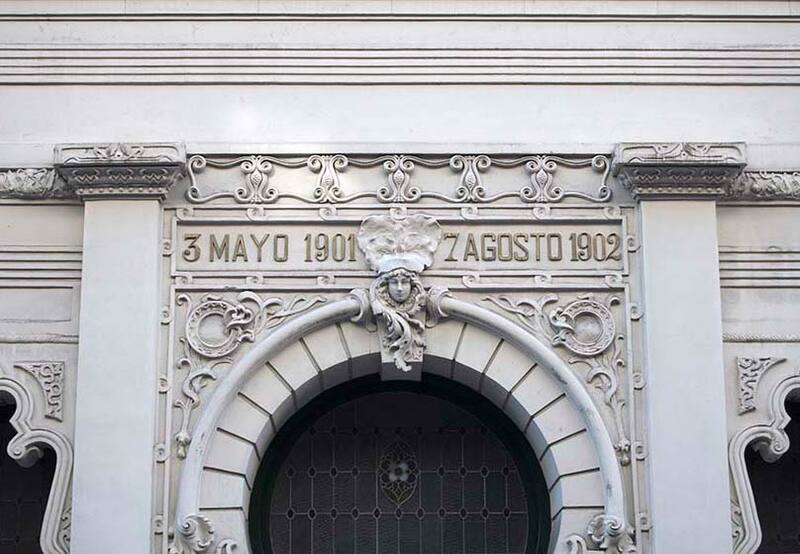 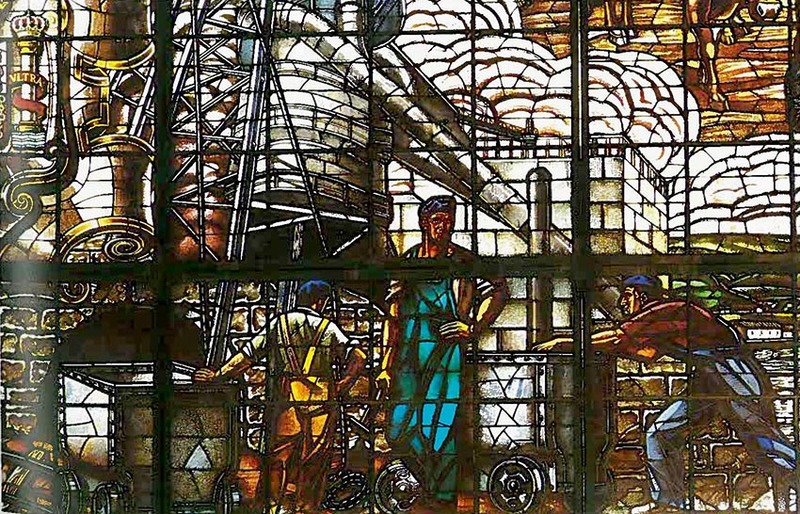 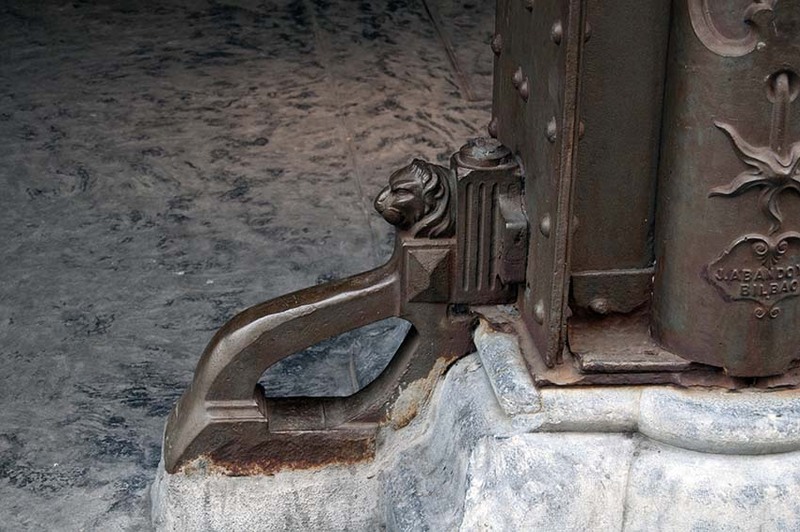 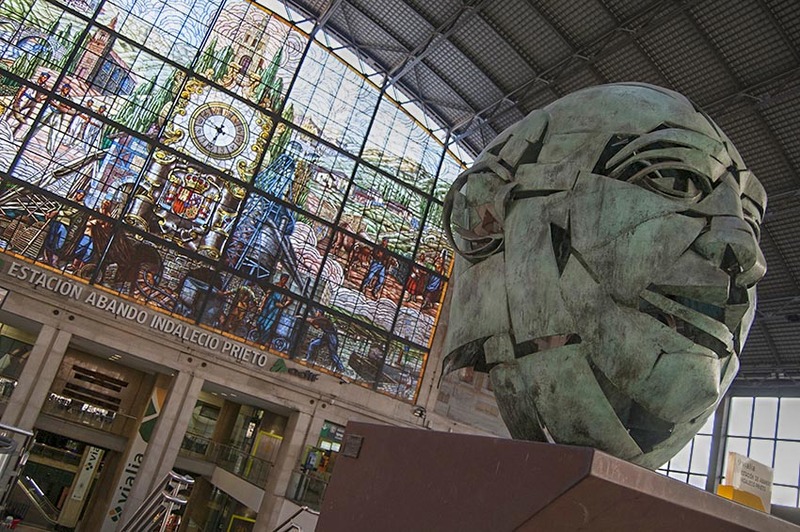 Between the two stations you will find the building of the Stock Exchange by Enrique Epalza, from 1905. 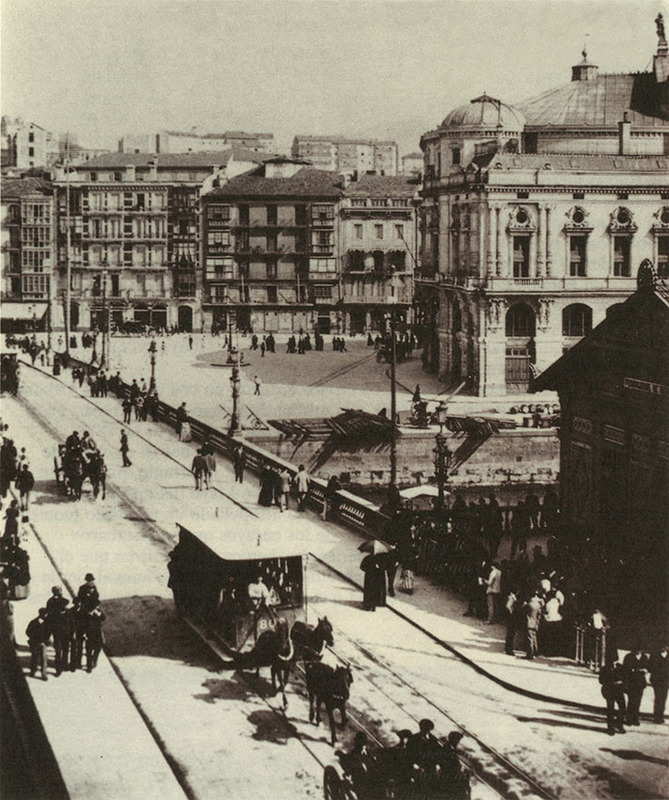 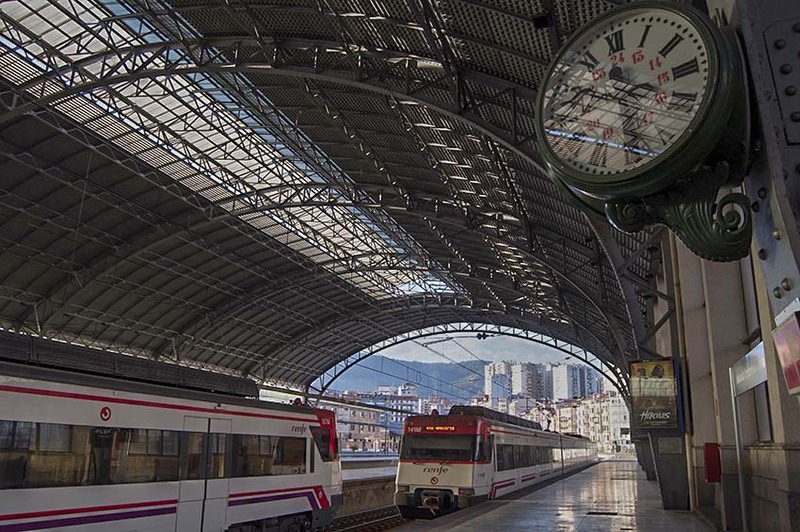 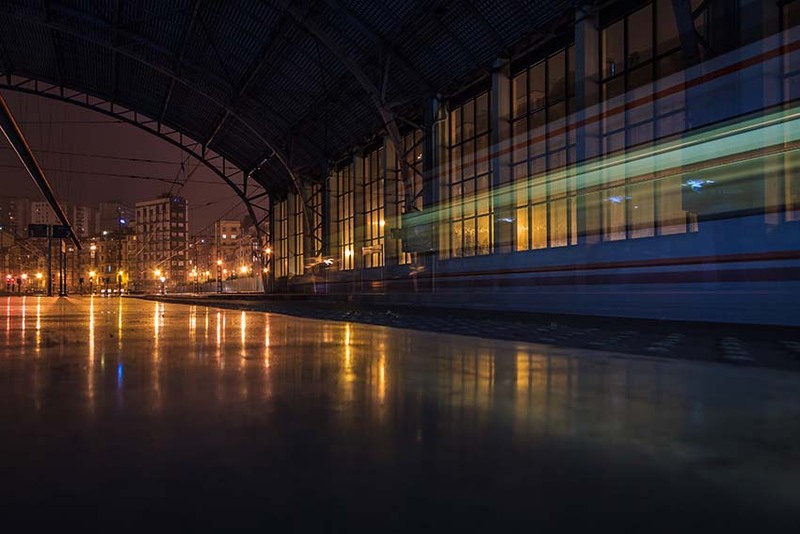 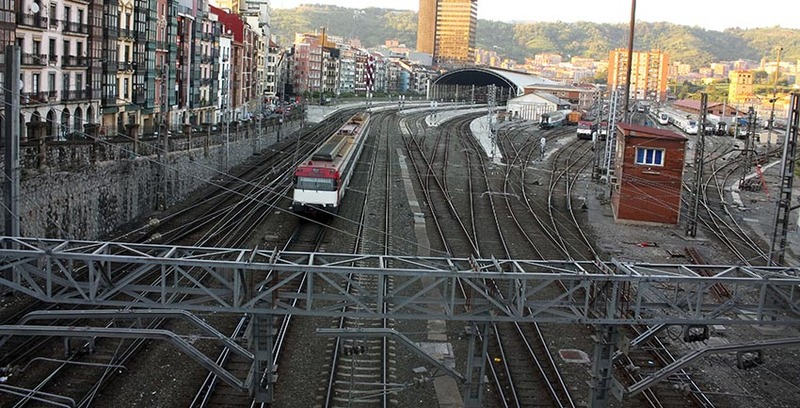 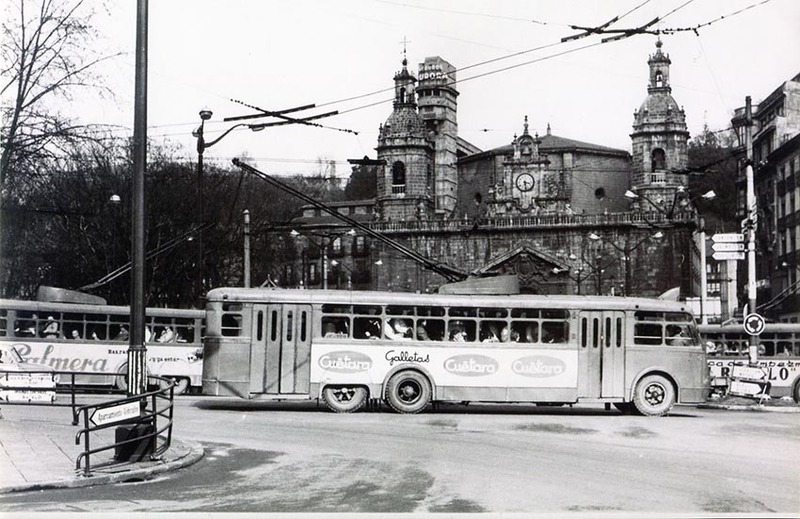 The Santander station, also known as La Concordia (21), is the station for the narrow gauge railways (FEVE) connecting Bilbao with other capitals on the Cantabrian coast and the north of the peninsula, in the latter case taking advantage of the train line that brought coal from inland mining areas to the Bizkaia steelworks. 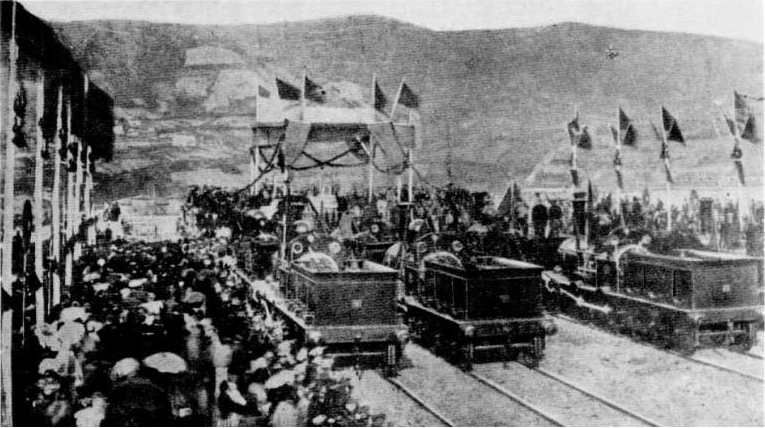 This is an interesting point regarding practices at that time; the processing companies were usually located in the coalfields and not the iron mines because of the relative cost of transport between the two materials. 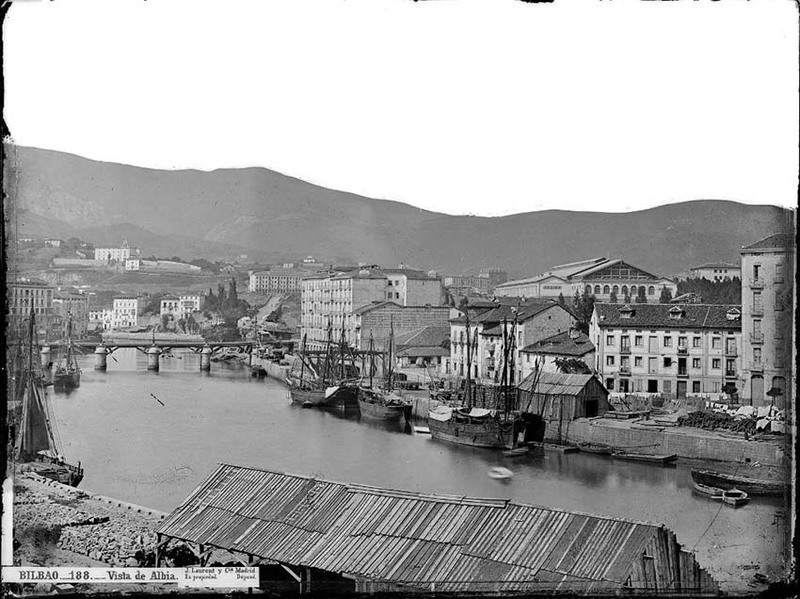 In Bilbao, it was exactly the opposite, because they had the raw material iron next to a river, estuary and a port with superb natural shelter. 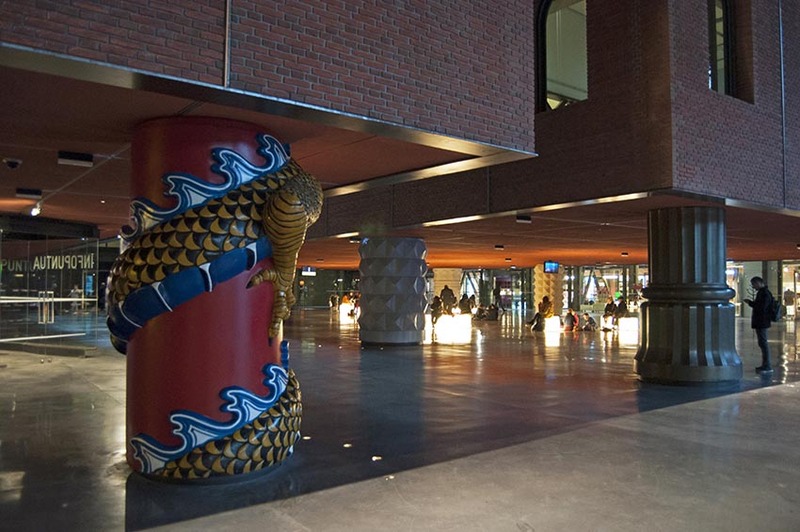 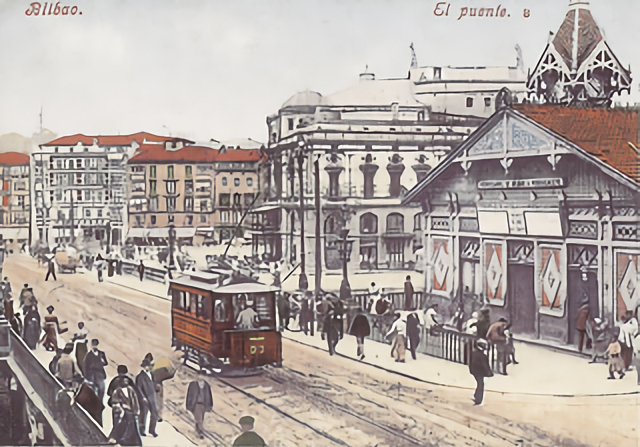 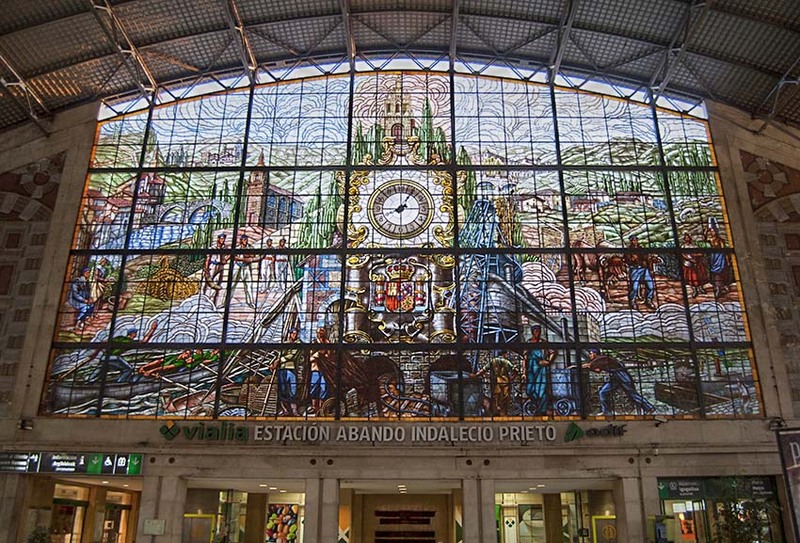 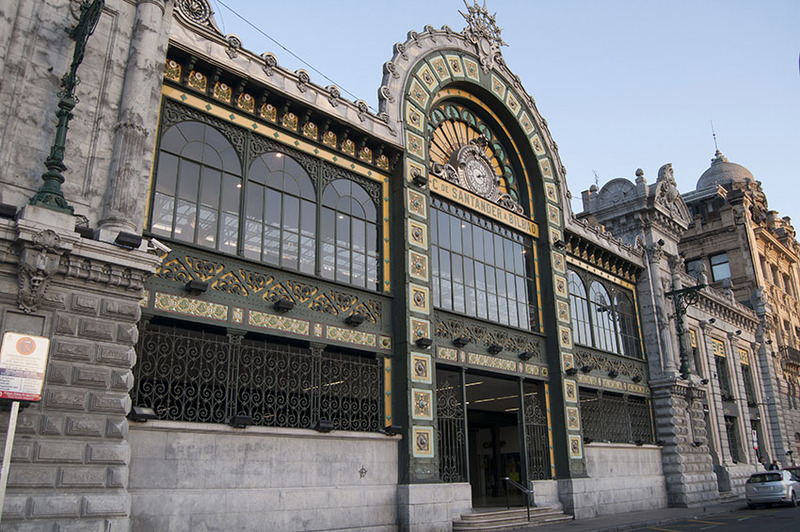 The station is modernist in style and was designed in 1902 by Severino Achúcarro. 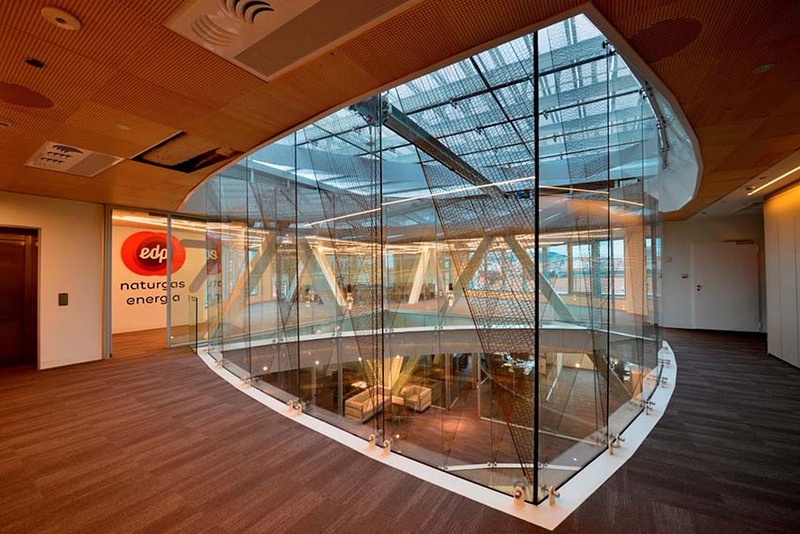 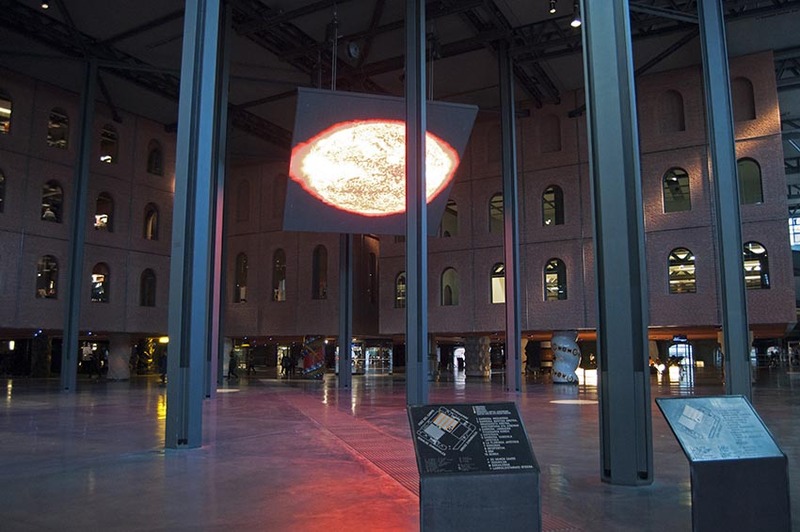 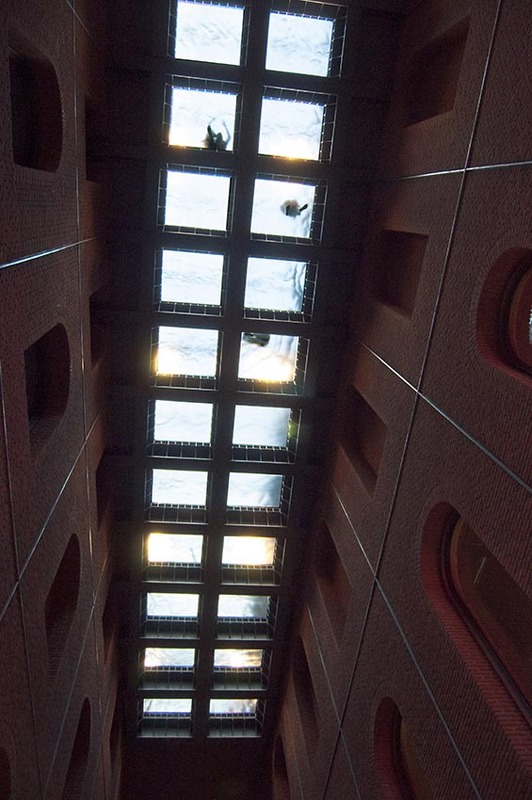 In the inner atrium we can see the application of new construction technologies with the use of steel. 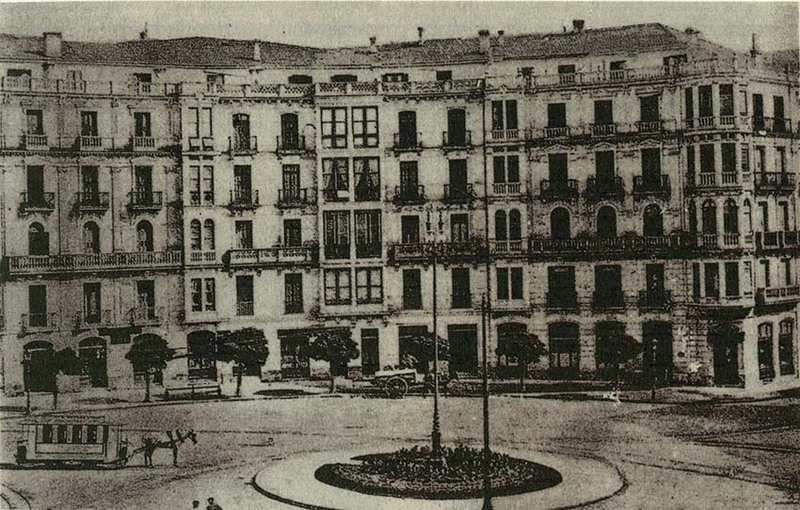 When you go out into Bailén street, you can see the facade with its large rose window, which is considered one of the most genuine legacies of the Belle Epoque. 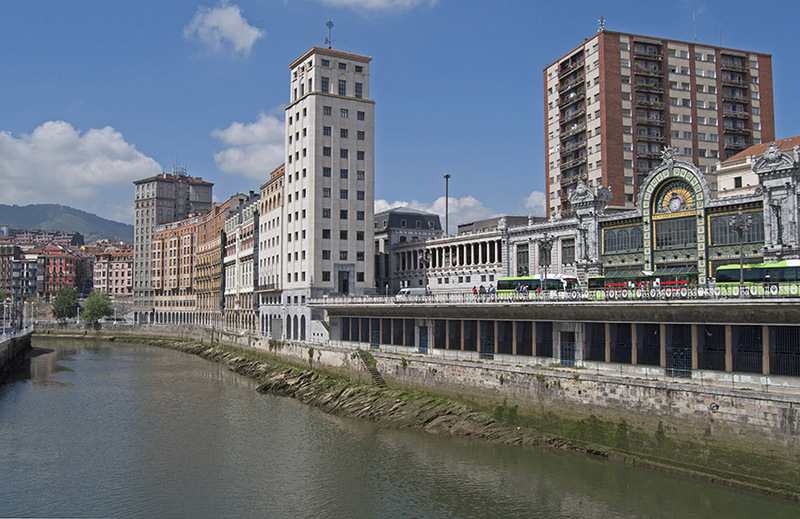 Outside the station, we can see the skyscraper that stands on the other side of Bailén street, facing the river (22). 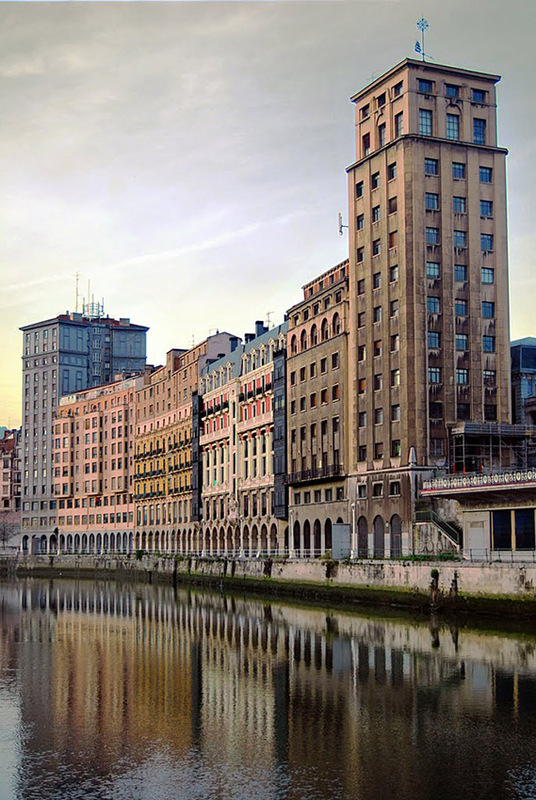 By Manuel Galíndez, at 43 metres tall it was the tallest building in Bilbao from its construction in 1943 until 1969, when the BBVA skyscraper in the Plaza Circular was built. 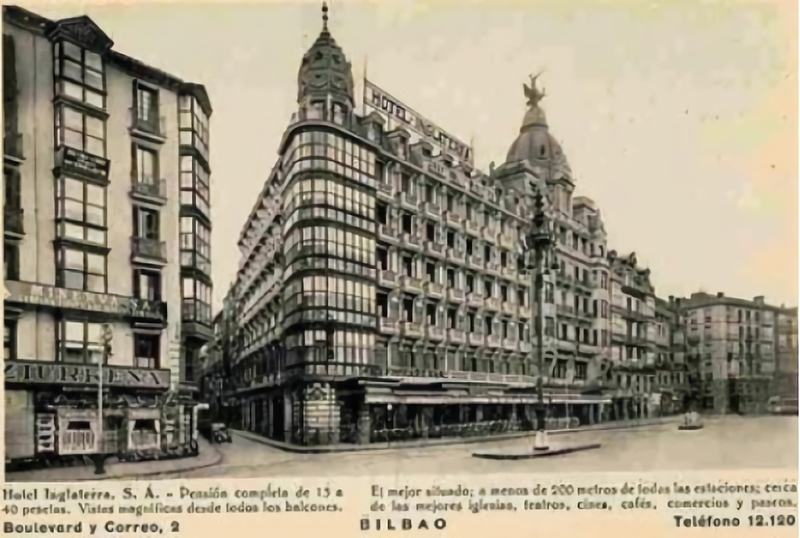 On the corner of Navarra street is the building that houses the La Bilbaína Social Club (23). 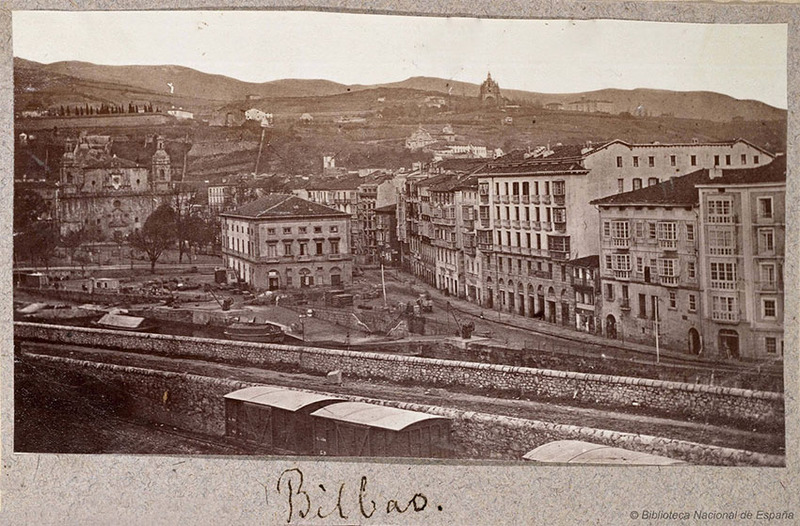 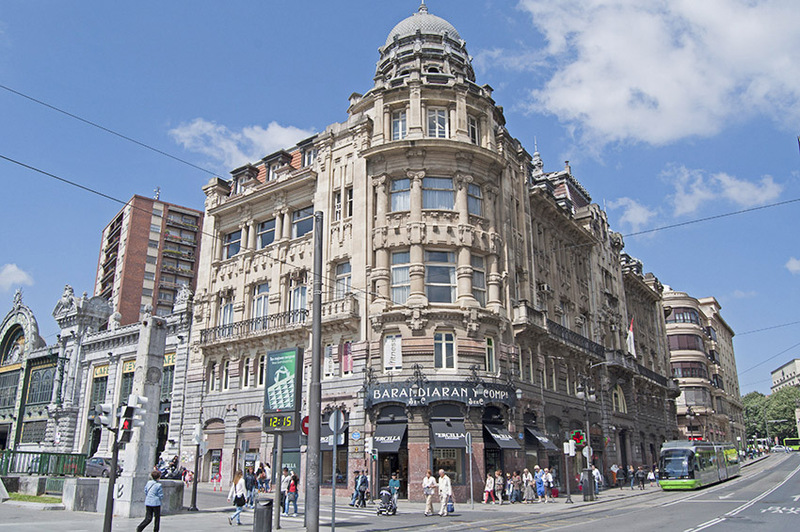 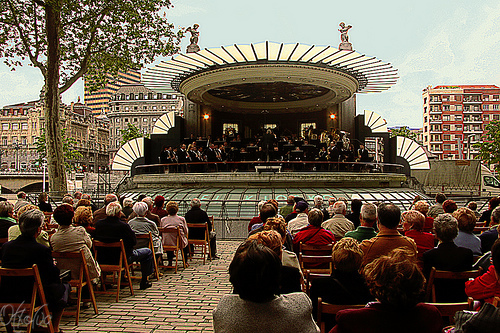 Both because of its appearance and its function, it is another expression of the effect that English society had on society in Bilbao; a relationship backed by intense business contacts that means that Bilbao, even today, is considered the city with the most British air in Spain. 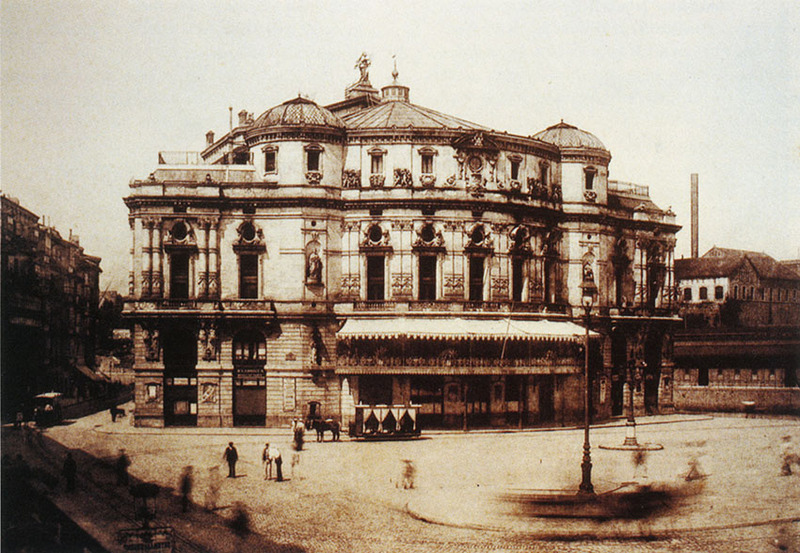 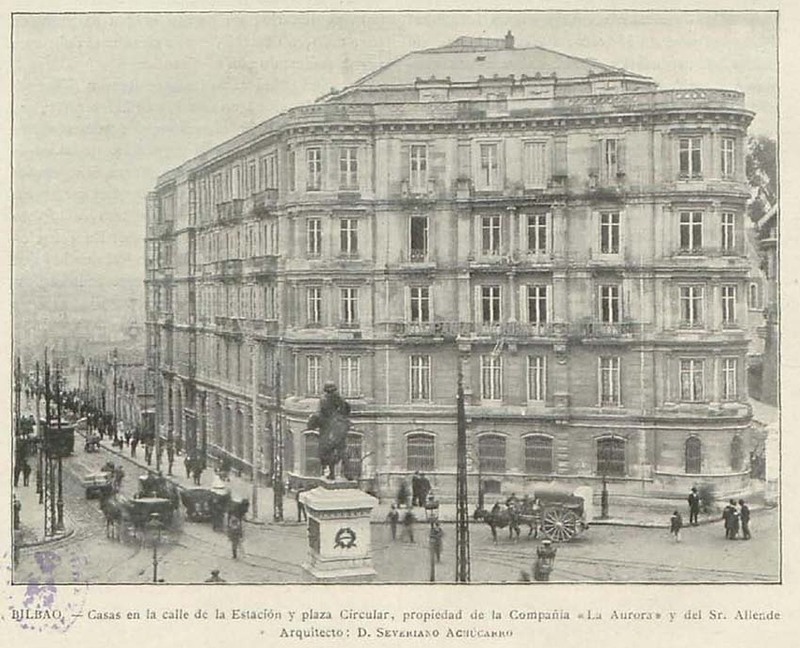 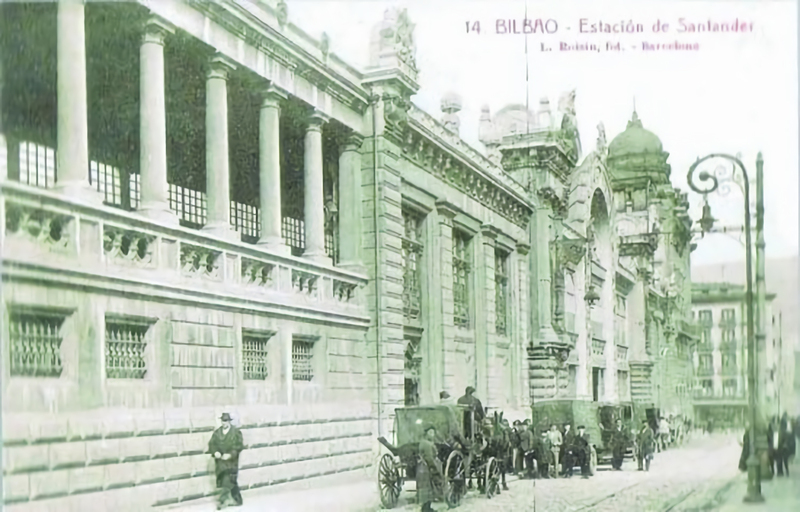 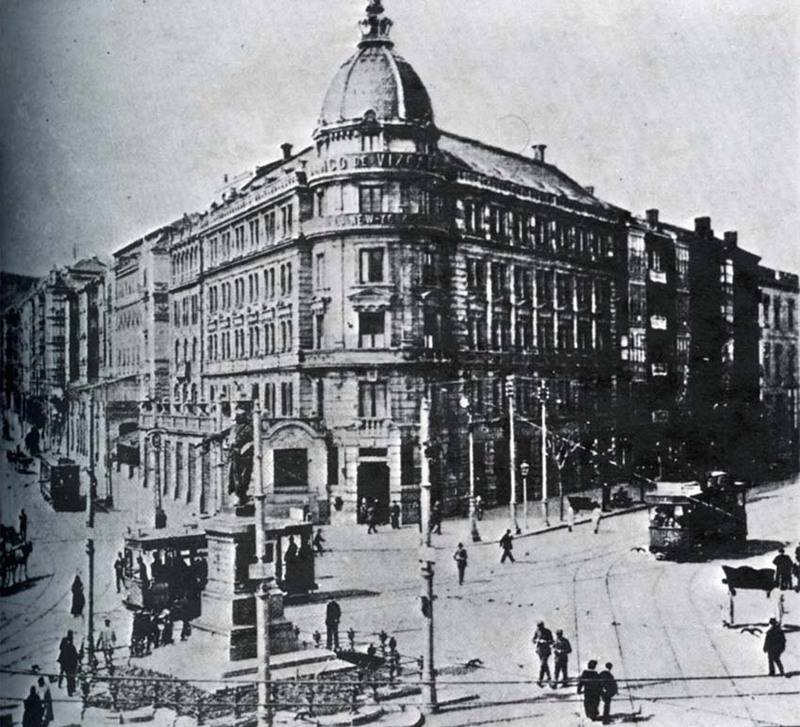 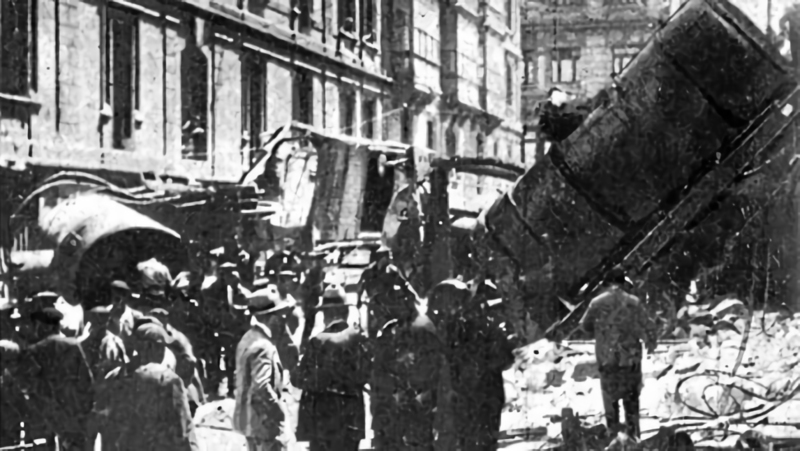 The building of La Bilbaína erected in 1913 was the work of Emiliano Amann and is the second headquarters of a club created in 1839. 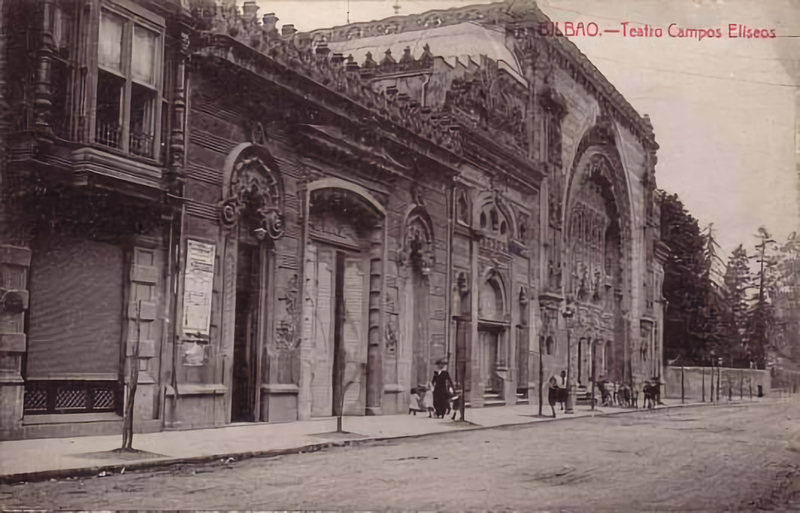 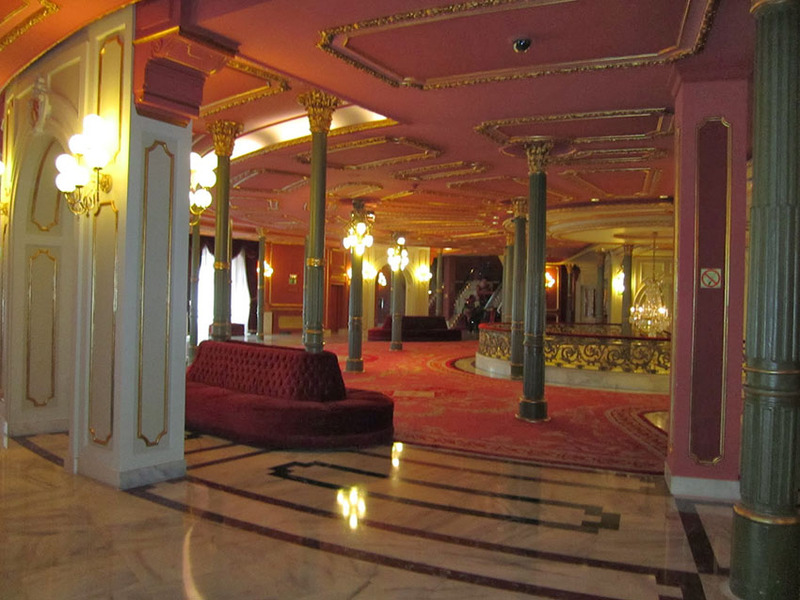 Since then it has opened its doors to high society celebrations and events of the city and surrounding areas. 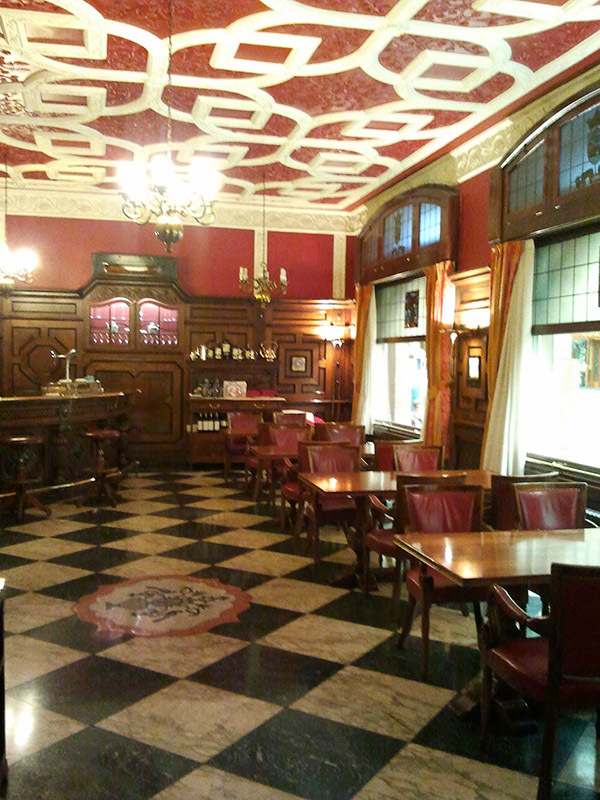 Apart from other facilities for members, of interest are its historical collections of newspapers and magazines and its library, its period furniture and its chess room, which is now considered the oldest in Europe. 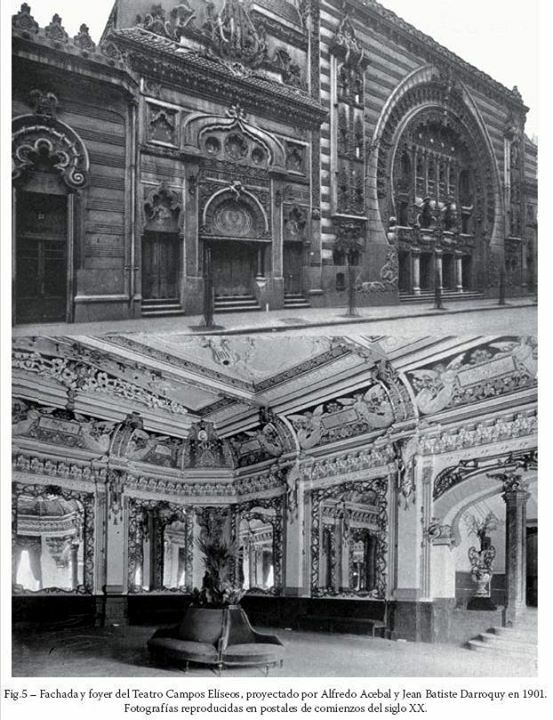 In style, the inside of the building follows the English architecture of such clubs, with a spiral entry staircase, topped by a skylight above, resting on columns. 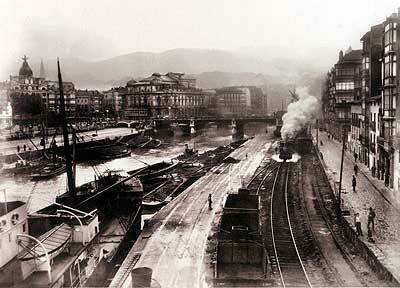 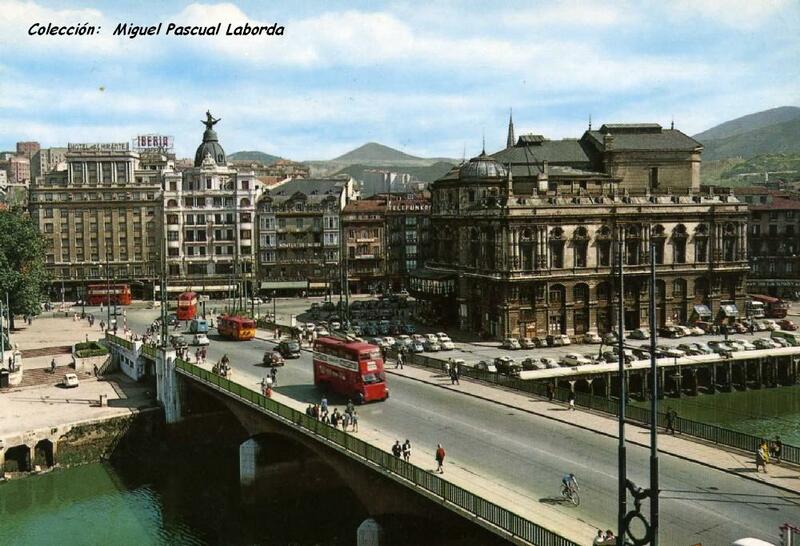 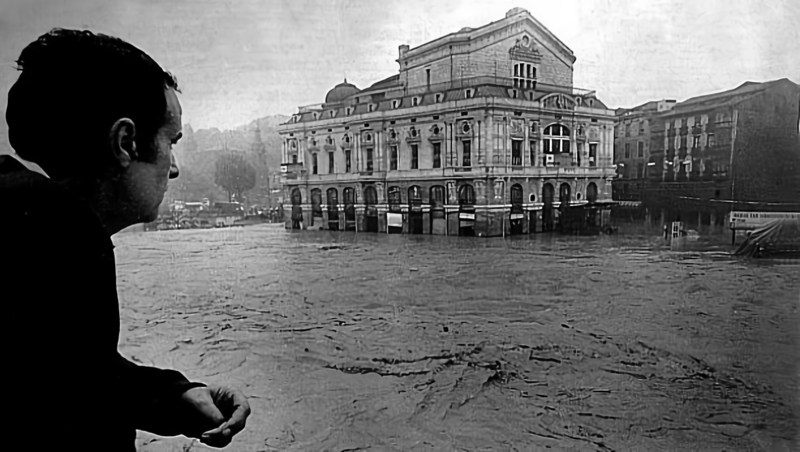 Just over the Arenal bridge, you will see on your right the famous Arriaga theatre (24), which opened in 1890. 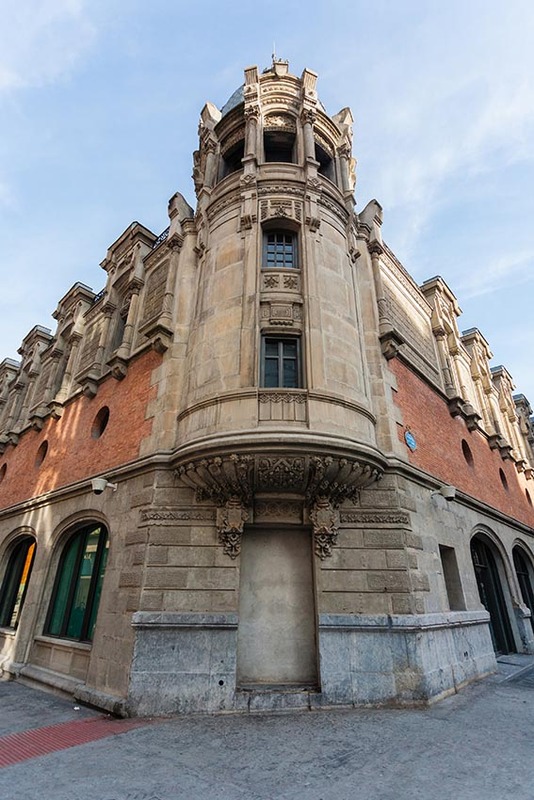 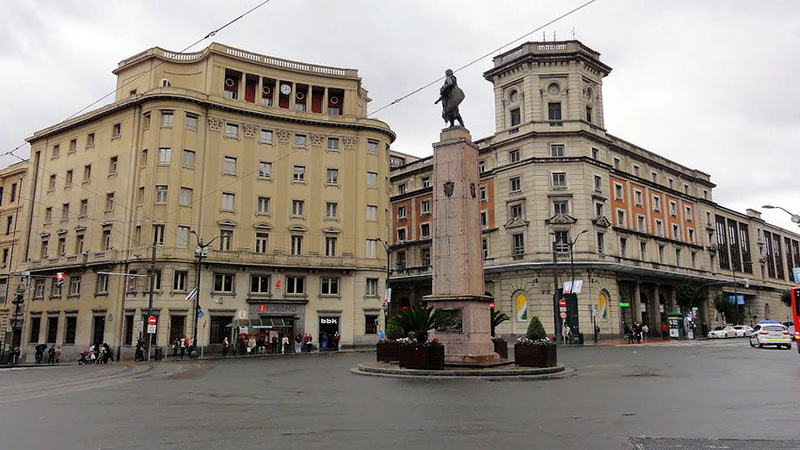 It was designed by the architect Joaquín de Rucoba (architect also of the City Hall) and replaced an earlier one that had stood there since 1833. 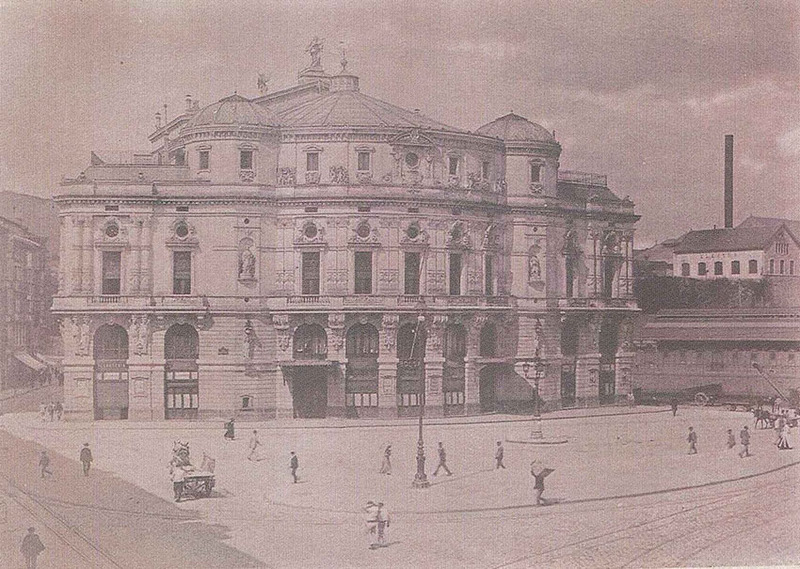 Inspired by the Paris Opera House and other central European theatres, it happens to have a curved facade not only because of neo-baroque aesthetics, but also to solve an urban planning hygiene concern about the end of Bidebarrieta street, which it is aligned with. 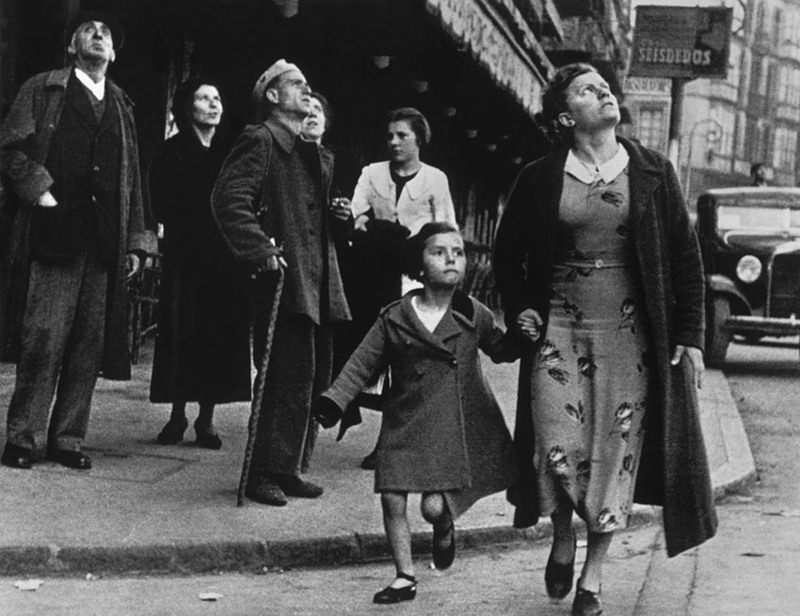 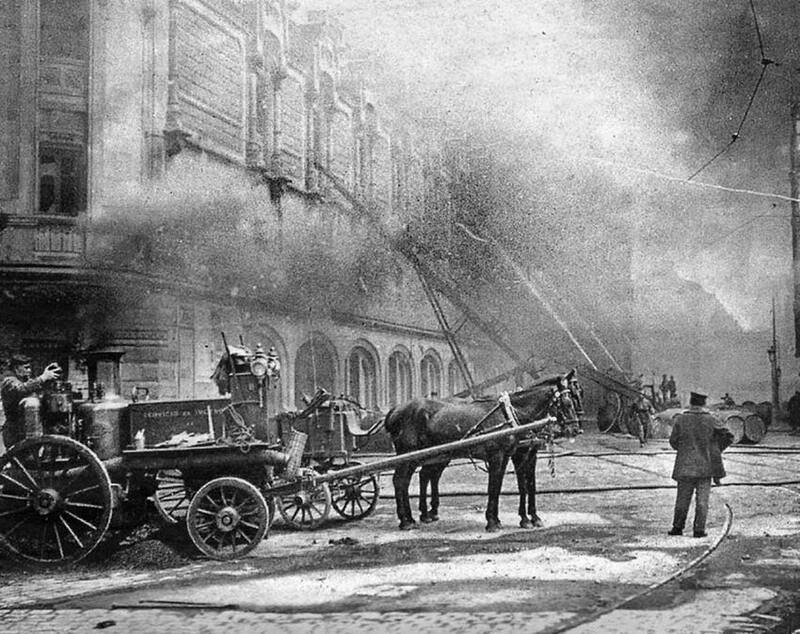 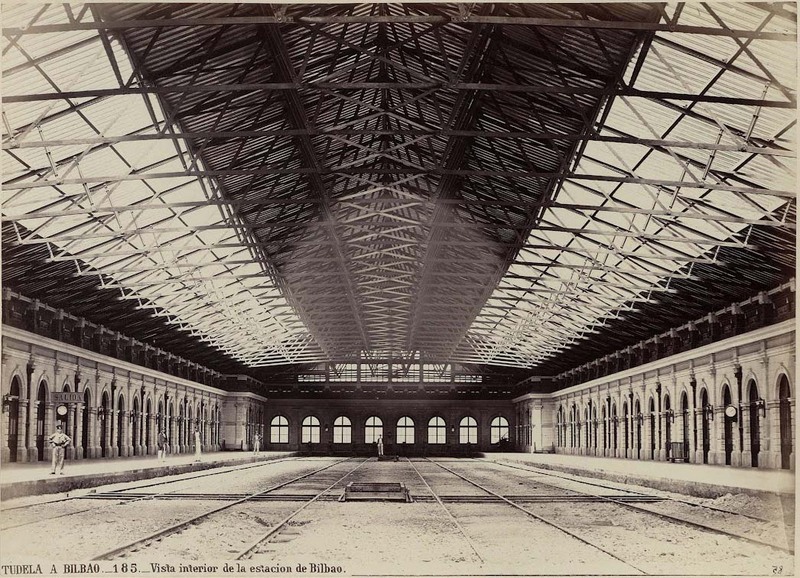 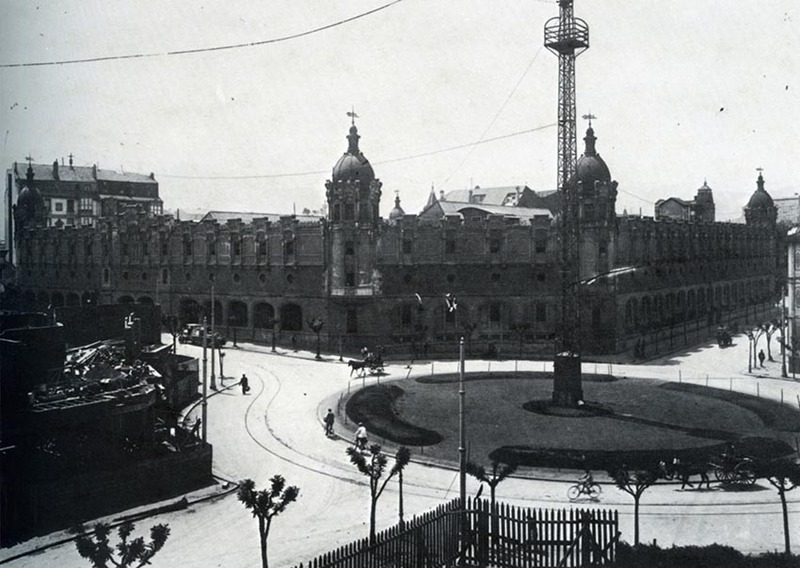 After a fire in 1914, it was rebuilt by architect Federico de Ugalde, with a project that made it bigger and safer. 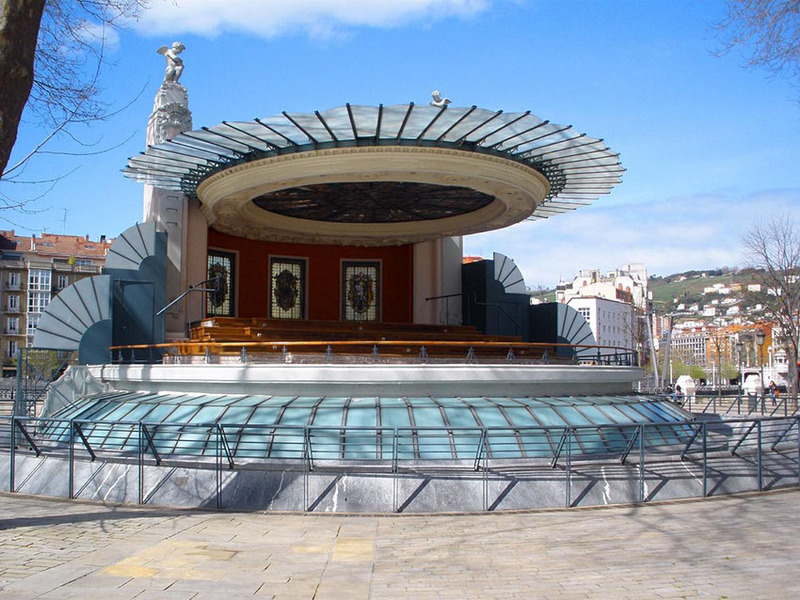 Passing through the Arenal gardens, you see the bandstand (25), designed by Pedro Ispizua in 1923. 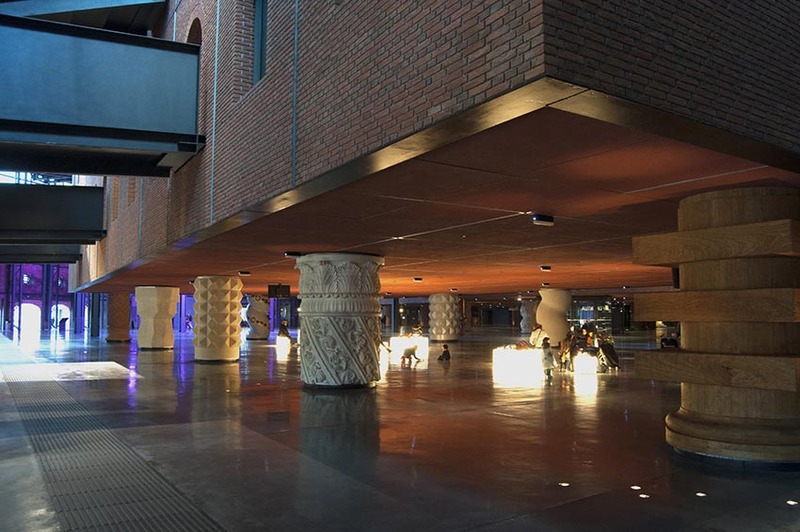 This highly expressive construction is made up of the space devoted to the music stage above and the bar that is located underneath. 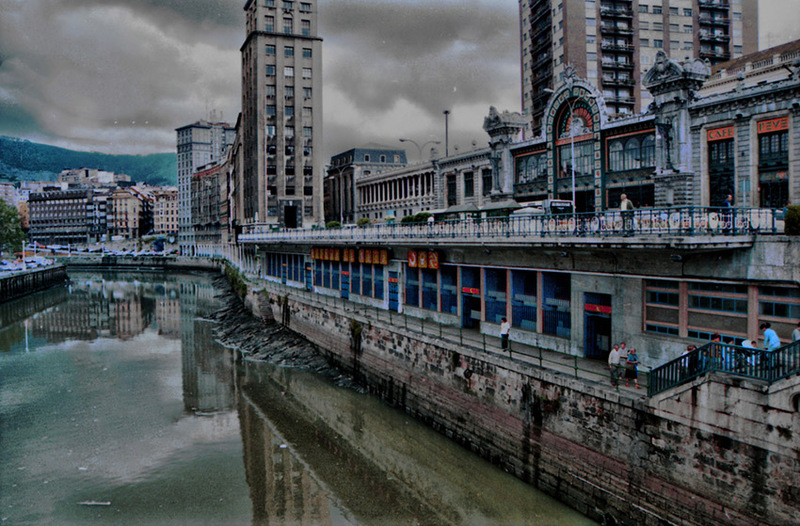 Before visiting the attractions of the Old Quarter (also known as the Seven Streets, as this is the number of roads that the original, small Bilbao had), and once you have crossed the Arenal gardens (the name "arenal" referred to the sand on what was once a beach in the medieval Bilbao), walk to the side of St. Nicholas’ church and stop in front of the original building of the Banco de Bilbao (26), one of the two parent companies of the merger with the Bank of Vizcaya and later with Argentaria to form the international financial entity BBVA. 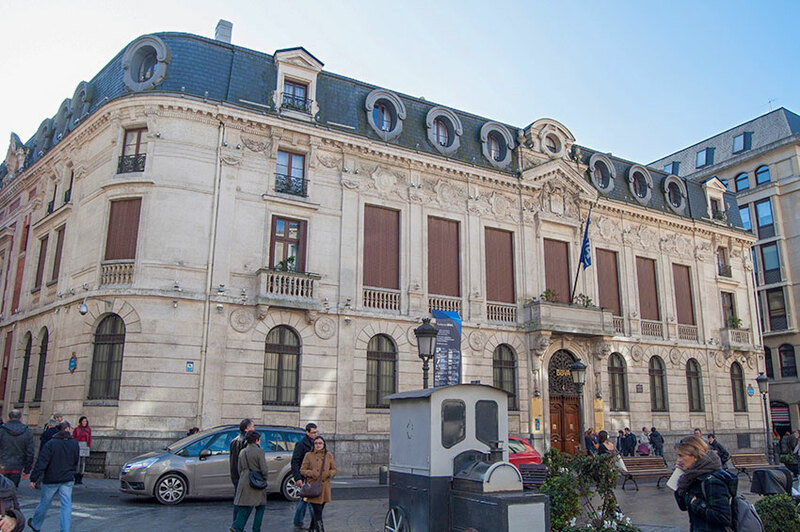 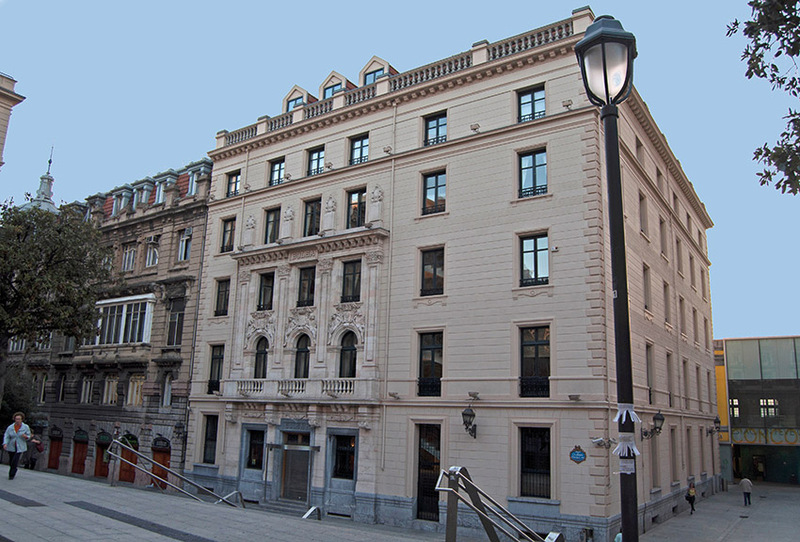 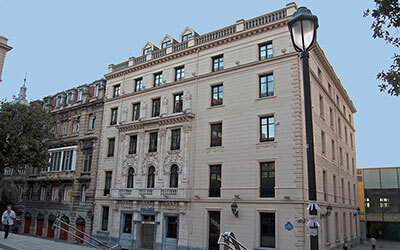 Although the Bank of Bilbao began operating in 1857, this office was opened in 1868; designed by the French architect Lavalle, it was expanded two decades later in two phases by Severino de Achúcarro and Enrique Epalza. 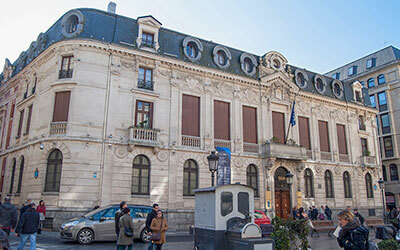 It has a magnificent banking hall accessible when there are exhibitions open to the public; the facade presents an eclectic exercise in the "Beaux Arts" style and has a neoclassical compositional touch. 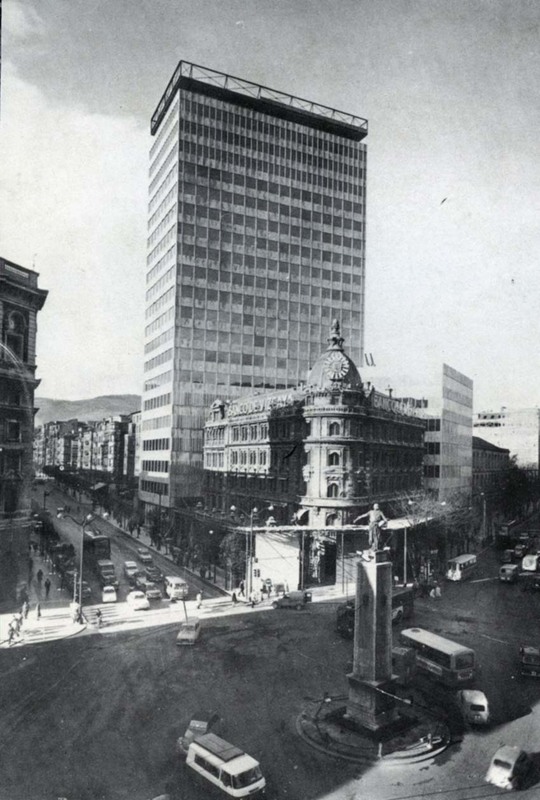 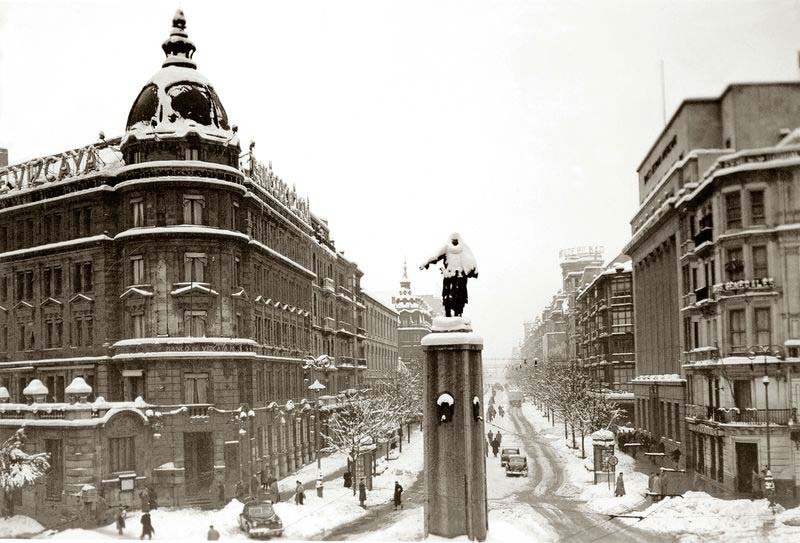 Today it remains the headquarters of the BBVA and banking operations were only moved in 1957 to the magnificent building at Gran Vía 12. 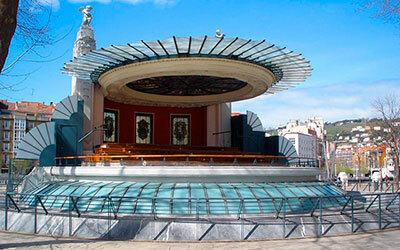 And now to enjoy the attractions of the Casco Viejo old quarter which probably appear on any other website.